The Japanese have one of the longest continuous ceramic cultures in the world, with the earliest ceramics dating to around 10 000 BC. The popularity of the tea ceremony from the 15th century fostered an aesthetic appreciation of ceramics, especially imported Chinese wares, which became valued as works of art. The strong demand for ceramics resulted in a surge of creativity during the Momoyama period (1573-1603), with thousands of kilns developing their own distinct regional characteristics. High-fired stoneware were central to this tradition. After the Japanese invasions of Korea in 1592 and 1598, a number of skilled Korean potters who had learned from the Chinese how to produce fine porcelain, were brought back to Japan. Some of these settled in Arita in northern Kyushu, where they discovered porcelain clay. 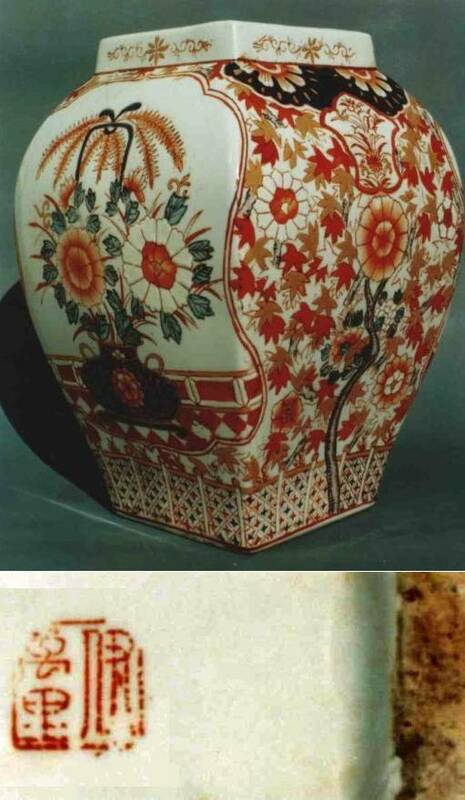 One of the Korean porcelain makers was Ri Sampei. He is considered as the "father" of Japanese porcelain. 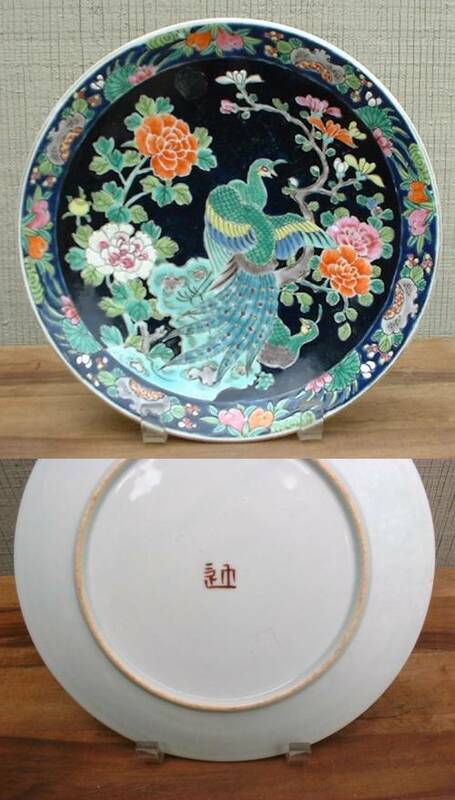 The area became Japan's major center of porcelain production and its products were also exported from the port of Imari. Due to trade difficulties with China by the end of the Chinese Ming dynasty, and an improved Japanese economy during the Momoyama period (1573-1615), a strong demand for Japanese ceramics resulted in a surge of creativity. Thousands of kilns developed their own regional style. High-fired stoneware were central to this tradition. This is also when we say that the modern Japanese porcelain industry started. Although Japanese porcelain production developed its own styles, the influence of Chinese and Korean porcelain traditions can often and easily be found. During the 17th and early 18th century Japanese porcelain, largely imported by the Dutch East India Company (VOC), was very popular in Europe and competed successfully with the Chinese. Blue and white Arita porcelain was copied on tin glazed earthenware in many places in Europe, of which Dutch "Delft" is the most famous. 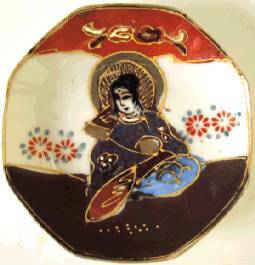 During the 18th century Kakiemon enamel decoration was also widely copied in England. 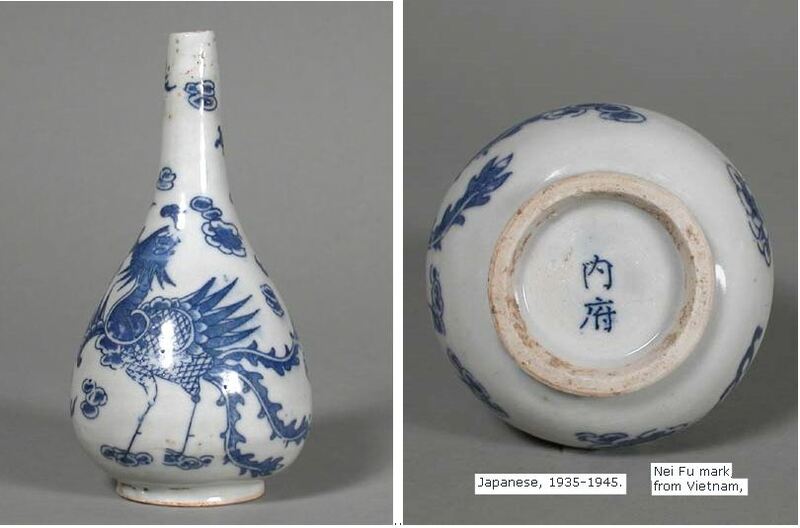 Even when Japan lived isolated from the rest of the world, during the entire Edo period (1603-1868), significant amounts of Japanese porcelain was exported to Western countries, mostly by the Dutch East India Company. With the new Meiji government, the old feudal system was changed and many highly skilled potters found themselves out of work. After many years of a strict regulation in the Edo period (1603-1868), a new Meiji government finally opened a door to the oversea trade. Traditionally trained artists and craft men, who had lost their feudal patrons, were welcomed to a new venture by the government and by entrepreneurs, to create new products attractive to the foreigners in America and Europe. When Japan now opened up for foreign trade and trade agreements were signed with America, England, Holland, Russia and France. Yokohama became a center for much of the new trade. Businessmen and entrepreneurs from all over Japan flocked around the port and to set up shops. Now, Japanese pottery and porcelain found new markets. The producers were inventive and could readily deliver anything the export market demanded. Their technique and skills were the traditional but the products were commercial, except a few true artisans, such as for example the Makuzu company. 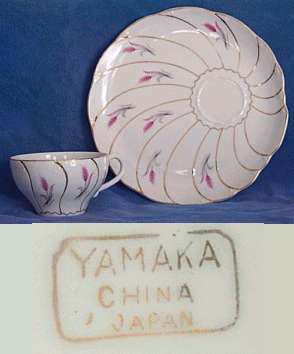 The pottery and porcelain made in and around the Yokohama port were known as Yokohama-yaki, including "Yokohama Satsuma", to which for example the Hodota brand belongs. These export products were made in small factories and workshops set up quickly, to meet foreign demands. Geographically the porcelain production was more spread out in Japan then in China, where most of the porcelain was made in the one city of Jingdezhen in the Jiangxi province. 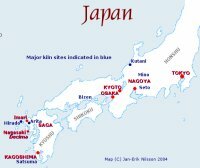 In a similar way, however, the center of the Japanese porcelain industry could be said to have been located on the southern island of Kyushu. The largest city on Kyushu is Arita while the largest nearby port was called Imari. These are the two most important names in the history of Japanese export porcelain. When it comes to quality and artistic merit the picture is infinitely more complicated. The old Japanese ceramic industry was in many ways smaller in scale compared to the Chinese. 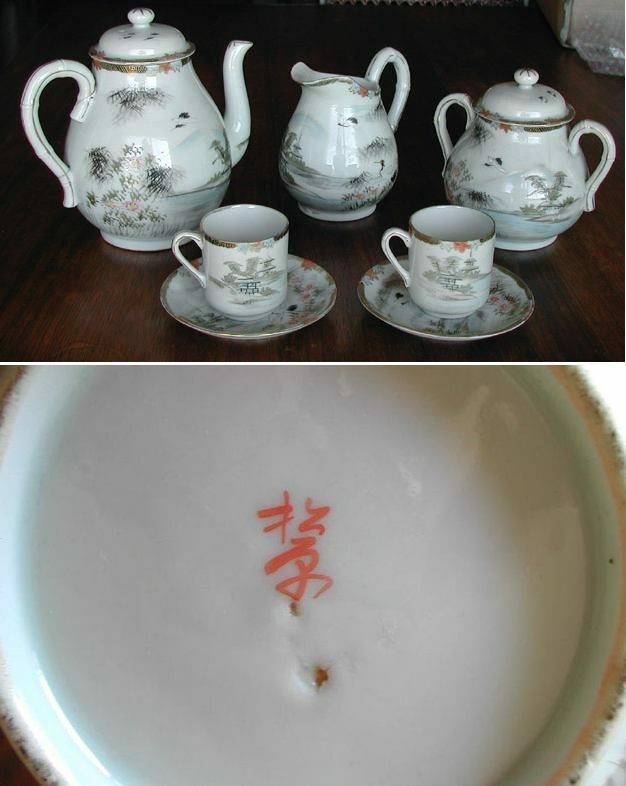 Marks was also applied for different reasons that on the Chinese porcelain. Personal signatures by the artists involved are quite common. 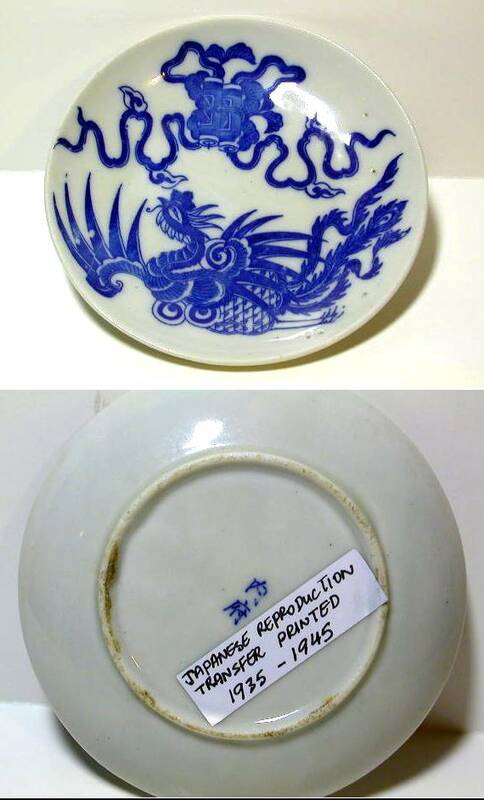 We also find a different attitude towards what marks that are put on the Japanese porcelain and in particular the export porcelain from the 19th century and onwards. The entire range of Imperial reign marks so common on Chinese porcelain, genuine or not, is mostly lacking. The marks are more commercially oriented, more numerous and can vary even within a set of pieces. They can indicate the name of the factory, the potter, the decorator, the pattern, the customer, the exporter, the importer or both or a part of them or maybe just say "Made in Japan", "Japan", "Nippon", "Happiness" or "Good luck" in any number of ways. 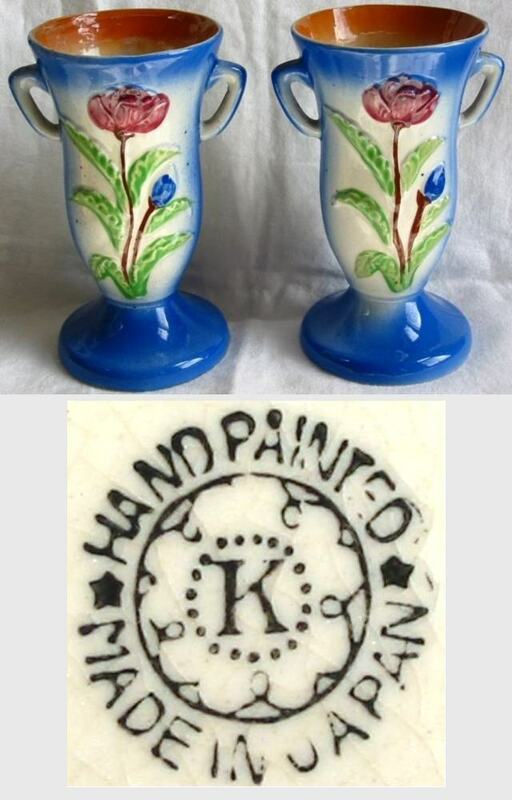 Increasing the confusion are the hundreds of porcelain decorating firms active in the early to mid 20th century simultaneously putting many different marks on the same wares seemingly at random but probably for some reason. To take just one example, the Noritake company which has been active for about one hundred years only, are thought to have used over 400 different marks. Marks and Seals. From various examples of pottery. The Character Zan, San, or Yama. 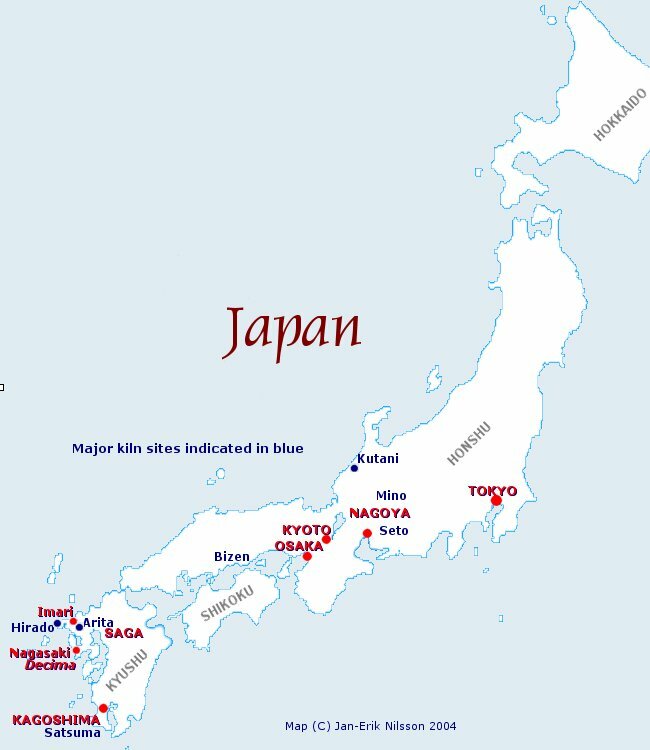 To immediately gain a better understanding on the many names that occurs in Japanese pottery and porcelain, I believe the map available here that indicates the most common kiln areas (blue names) and cities (names in red) will be helpful. Edo period (1603-1867) roughly split into early, middle or late Edo. Sometimes the Genroku era (1688-1703) when popular culture flourishes is distinguished. The marks are normally read from top to bottom, and right to left. 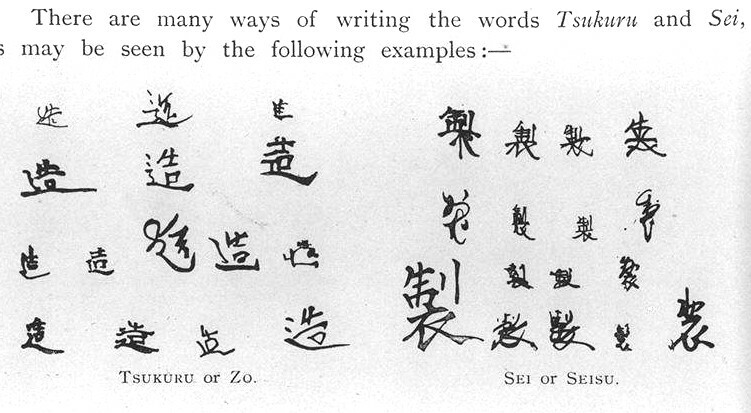 Signatures are usually followed by a suffix, for example Sei, tsukuru or saku all meaning "made", or Ga, Dzu or Fude meaning "painted" or "drawn". 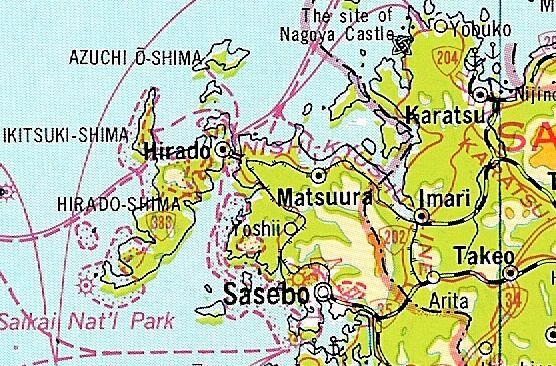 Then there are place names, Satsuma, Kutani, Seto etc. Marks and Seals. From various examples of pottery. Tsukuru or Zo. Sei or Seisu. To read these requires references such as a good Japanese/English dictionary such as Nelsons. One simple and easy guide to reading & writing Japanese is Ed Florence Sakade & al. J Bowes, Japanese Marks & Seals is very helpful as is Koop & Inada, Japanese Names. It is a very unrewarding task to go through lists of marks and signatures as the below in the hope of finding the exact one to match yours, however a modest amount of study can produce a big difference. Beware though, it can become an obsession. 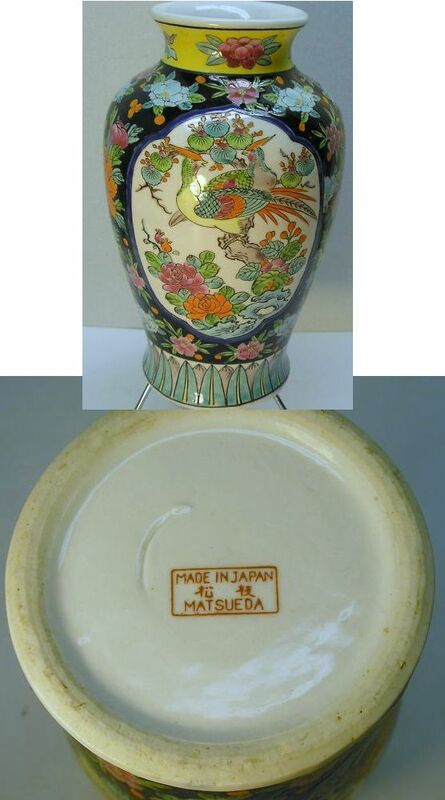 Satsuma porcelains - mainly produced in and around the city of Kagoshima in Kyushu. Wares of this type are finished in ivory lustre with fine crackles. They have a picture of a number of artisans sitting at the traditional low Japanese tables hand painting vases. Arita porcelains - produced in the Saga prefecture of Kyushu. 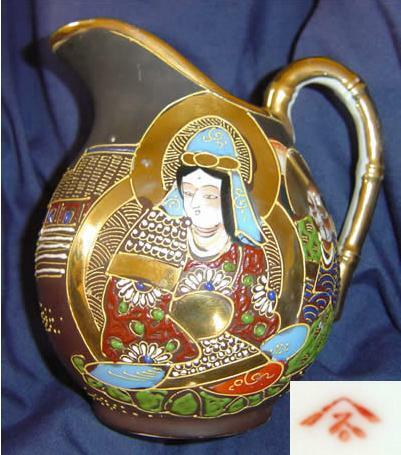 Kutani porcelains - produced in the prefecture of Ishikawa in the Hokuiku district of Honshu, the Japanese main island. On the whole Kutani porcelains are characterized by their elaborate picture decorations in thick gold, red, blue and some other colors. As for Kyoto wares, Rakuyaki of Kyoto, closely connected with tea ceremonies since olden days. Awata ware porcelains and Kiyomizu wares are among the souvenirs of Kyoto. Seto ware. "The province of Owari, with Nagoya as its commercial and industrial metropolis, is the greatest ceramic center [of Japan] so far as the amount of products ... Owari produces so many varieties of porcelain and stoneware that the Japanese familiarly speak of porcelain and pottery in general as "setomono" after the village of the same name in this province." Bizen ware (Okayama Prefecture) characterized by their peculiarly humorous figures of gods, birds and beasts. Banko wares (Mie Prefecture) which are mostly unglazed. Awaji wares (Awaji island) monochromatic with a bright yellow or green glaze. Soma pottery (Fukushima Prefecture) on which a picture of a horse is usually seen. Department Stores: Mitsukoshi; Matsuya; Matsuzakaya; Takashimaya; Shirokiya and Imperial Hotel Arcade. 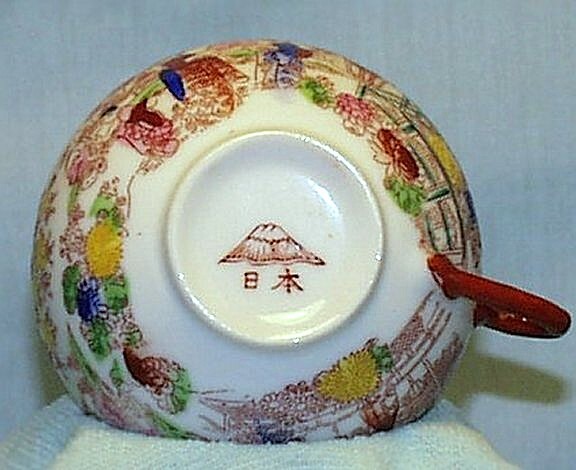 Porcelains: Fukagawa Porcelain Manufacturing Co.; Koran & Co.
Department Stores: Mitsukoshi; Daimaru; Hankyii; Nankai-Takashimaya; Matsuzakaya; Sogo; Takashimay; Izutsuya; Mikasaya. Curios: T. Shibata; Harishin; K. Nikko; K. Yoshida & Co.
Porcelain & lacquer: Chujyo Shoten; Harishin; Koshiishi Shoten; Miyazaki Shoten; K. Nikko; Ogurusu & Co.; Suzuki & Co.; Taniguchi & Co.; William Rae; Gengan Yamamoto; Yamato Bros. & Co.; K. Yoshida & co. The booklet gives the street addresses of all shops as well. Hopefully this contribution by Elyce Litts will greatly help our understanding of 20th century Japanese porcelain marks. The method used for suggesting dates on the following marks is the empirical and that of the arts historian. When possible I have compared the marks with documents, files and archaeological data and these references have been added here when possible. Unfortunately I have no further information on these marks than what is published here. 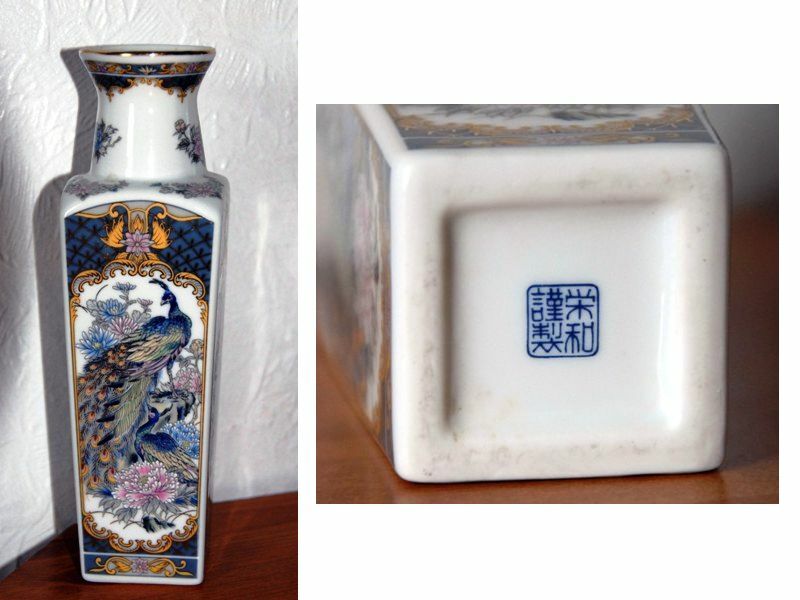 For further discussions on antique Chinese and Japanese Ceramic Art you are seriously recommended to sign up with the Gotheborg Discussion Board. If you would like my personal help or opinion on something, there is a possibility to email me a question and help support the site at the same time. Click here to ask a question. Around the 1840s Ashley A. Vantine (sometimes Van Tine) started a provision and supply business in San Francisco. He continued in California until 1869, when he came to New-York and established himself in the Oriental goods business, opening his first shop for oriental wares in New York in 1869 on Broadway, near Eighth-street. A few years later he moved to 831 Broadway, and from there, in 1883, to 879 Broadway. Mr. Vantine traveled a great deal, particularly to China and Japan, crossing the Pacific sixteen times and made six visits to Turkey and Southern Russia. The company seems to have began their business in Yokohama, Japan, already in 1865 for the purpose of manufacturing wares for export to the West. They even started a mail order business and came to have their own factories in Yokohama and Nagoya, Japan. A catalogue from 1917 is preserved at the University of Delaware Library. The text states that the book "enables you to rest comfortably at home in your easy chair, and, at your leisure, select by mail, with absolute confidence, from the largest collection of Oriental goods in America." Offerings include not only toys, but clothing, perfumes, jewelry, and pottery. The business seems to have shut down around 1951. 895. Mark: Crossed Imperial Chinese and Japanese flags with the Turkish crescent moon and star in-between, referring to Mr AA Vantines business relations with these three countries. Tentative date: c. 1910-20s. 771. Mark: Crossed Imperial Chinese and Japanese flags with the Turkish crescent moon and star in-between, referring to Mr AA Vantines business relations with these three countries. Tentative date 1930-40s. 772. Mark: Crossed Imperial Chinese and Japanese flags with the Turkish crescent moon and star in-between, referring to Mr AA Vantines business relations with these three countries. 789. Mark: Crossed Imperial Chinese and Japanese flags with the Turkish crescent moon and star in-between, referring to Mr AA Vantines business relations with these three countries. From the look of the porcelain designs I would suggested the 1920-30s for this piece. 37. "ORIGINAL AEROZON", The 2 characters are read from top to bottom NICHI and HON, which read together as Nippon (= Japan). Date after 1940, tentatively around 1958/1959 - 1962/1963. 55. "ORIGINAL AEROZON", The 2 characters are read from top to bottom NICHI and HON, which read together as Nippon (= Japan). Date after 1940. Porcelain was produced in Arita for the first time in 1616 under the control by the feudal lord of Nabeshima, or the present Saga Prefecture. Arita ware is also called Imari ware because the products of the Arita kiln were mainly shipped from a nearby port of Imari. 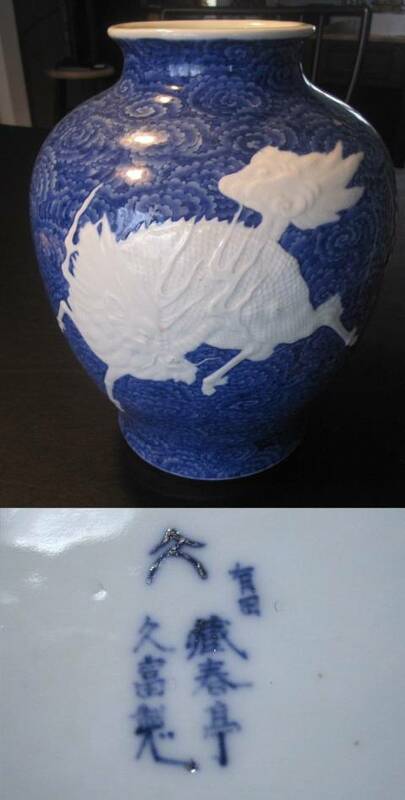 Arita porcelains of the early days were typically made in the Chinese style of the period, with deep-blue patterns on a white background, called sometsuke = "blue-and-white". In the 1640s, a new style called aka-e" was invented, characterized by bright colors and bold patterns principally in red. 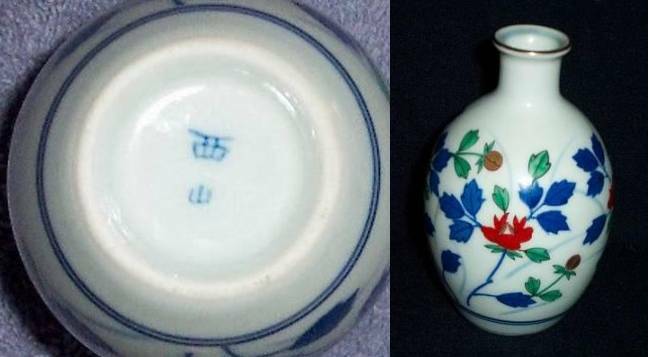 These two styles, "sometsuke" and "aka-e," dominate Japanese "Arita/Imari" wares. The products of the 17th and 18th centuries are typically called "Ko-imari" (old Imari) and "Ko-sometsuke" (old blue-and-white). kigyoku houtei no chin (奇玉宝鼎之珍) "rare precious treasure"
912. Mark: Saishintei Keiko (Woman's name), however J Bowes in Japanese marks & seals reproduces the same mark which he gives as 'Saishintei Sisi' (male name). Japanese porcelain, probably Arita. Early 20th century. 129. Seal reading Arita-yaki - , the left being a single character, early to mid 20th century. 1516. Seal reading Arita-yaki - , the left being a single character, early to mid 20th century. 743. "Arita" Modern mark, Late 20th century. Aoki, Porcelain made in Arita. Full name: Aoki Kyodai-Shokai (Aoki Brothers Company) or Dai Nippon Hizen Arita Aoki-sei. The Aoki Kyodai-Shokai was founded in the 1890's by Aoki Jinichiro (1863-1955). 1193. Mark: Mark: Aoki, Arita porcelain made by Aoki Brothers Company. Arita. Bowl. Diameter 12", height 5". 948. Mark: Aoki. Arita porcelain made by Aoki Brothers Company. Tentative date c. 1950. 1058. Mark: Aoki. Arita porcelain made by Aoki Brothers Company. Plate with one firing support mark. 1503. Mark: Aoki. Arita porcelain made by Aoki Brothers Company. 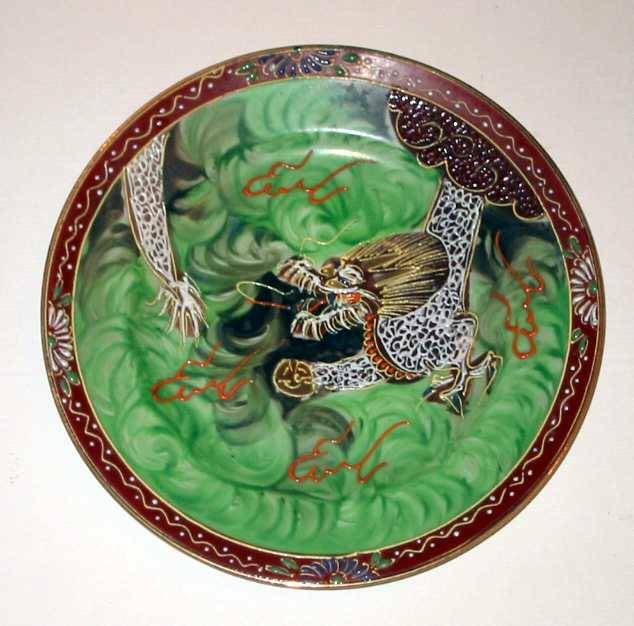 Plate with underglaze blue decoration in Chinese 'Kangxi' style. 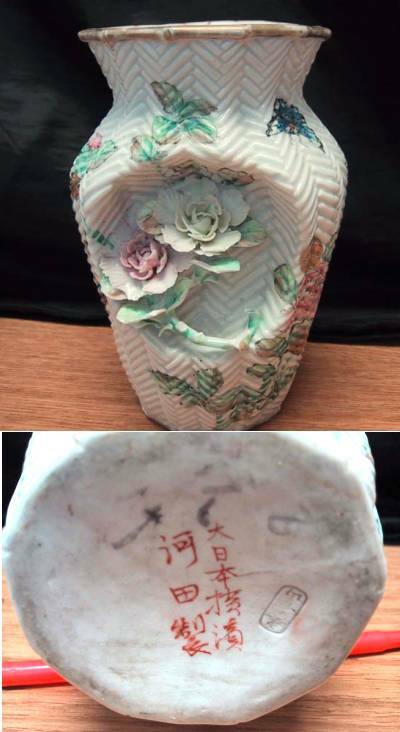 Porcelain with marks imitating Chinese marks of the Ming period were made at the Arita kiln during the 19th century and possible earlier. 945. Mark: sei ka nensei - Chenghua period Make (成化年製), attributed to the Chinese Ming dynasty Chenghua period (1465-1487). Japanese, 19th century. 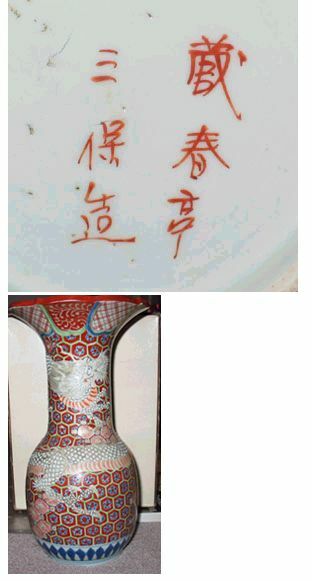 Porcelain with marks imitating Chinese marks of the Ming period were made at the Arita kiln during the 19th century and possible both earlier and later. 881. 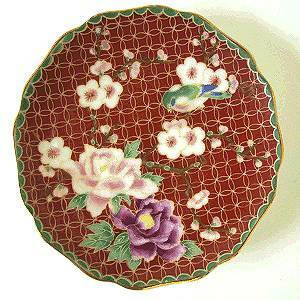 Arita porcelain dish with Japanese 'Imari' decoration. Mark: taimin seika nensei - Great (Greatest) Ming dynasty Chenghua period (1465-1487) Make (太明成化年製). Japanese, Taisho period (1913-1926). 946. Mark: Tai Ming Chenghua Nian Zhi, meaning "Greatest (sic) Ming Chenghua make". 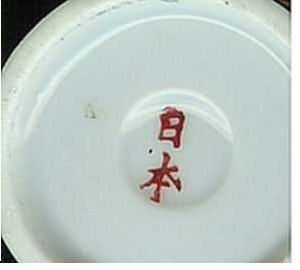 Common mark on Arita "Imari" porcelain, a mixed-up and carelessly written Chenghua mark; the extra dot in the fist Da character changes the meaning from Da (great) to Dai (greatest). In Chinese this mark would read Dai Ming Chenghua Nian Zhi and in Japanese; Daimin seika nensei (太明成化年製) however it is usual to read these Japanese-Chinese marks in Chinese, to not add to the confusion. Date: Imari porcelain is difficult to date but being this mainly an 18th-19th century mark and considering the style of the bowl a suggestion for the date is end 18th century/early 19th century. 929. Mark: in Japanese; Daimin seika nensei (太明成化年製). In Chinese pinjin Da Ming Chenghua Nian Zhi, Chinese style mark, meaning "Great Ming Chenghua Period Make". Decorative mark from late 20th century. Fuki Choshun written in Kanji characters (富貴長春) meaning Wealth, Nobility, Longevity and Youth, also translated as "Good fortune and long life" or "Wealth and Everlasting Spring". Alternative translations add that fuki (huki) also means peonies and is a symbol of wealth and choshun means roses, a symbol of everlasting spring as in, forever young. This mark was mainly used during the Meiji Period, from 1868-1912. During this period, Japan moved from being an isolated society to one with more open trade, where this one of the earliest trade marks not imitating a Chinese Imperial Nian Hao (reign mark). 880. 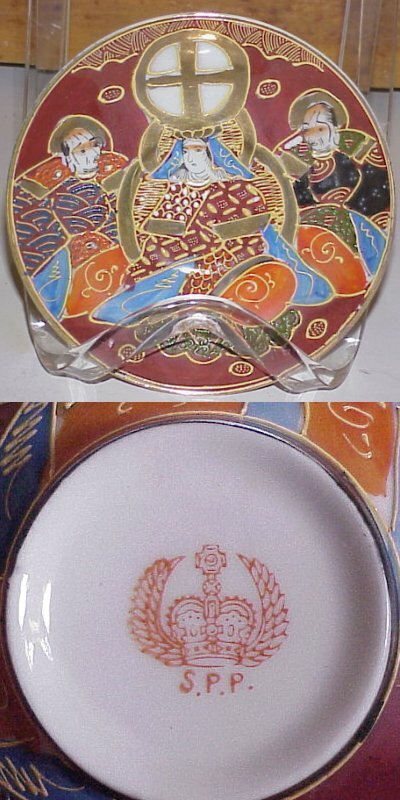 Arita porcelain food (rice) bowl with Japanese 'Imari' decoration. Mark: Fuki Choshun. Early 19th century. 883. 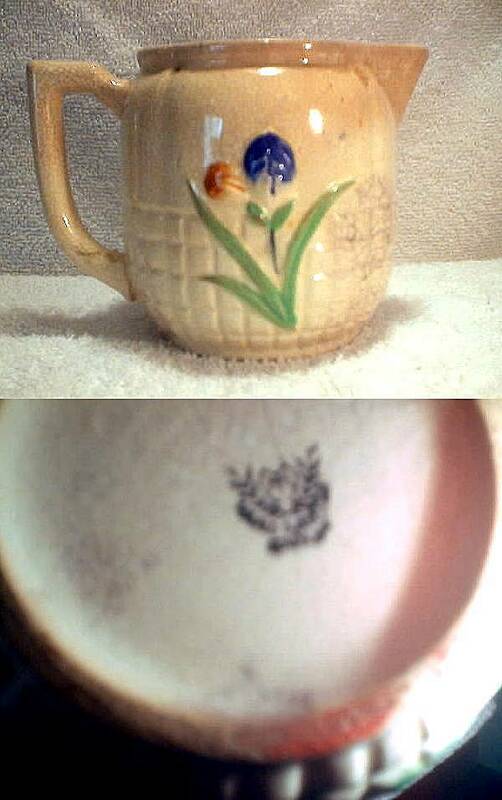 Japanese porcelain with Nabeshima looking enamel decoration. Mark: Fuki Choshun. 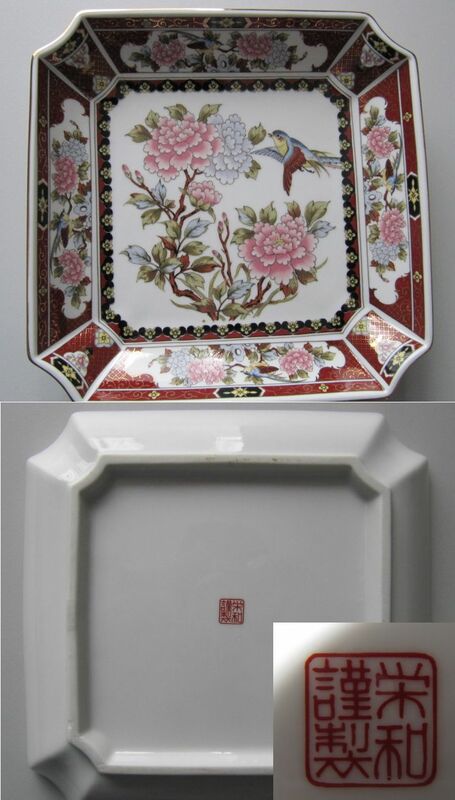 Date: this dish probably Meiji (1868-1912) period. 884. Japanese porcelain with Japanese 'Imari' decoration. Mark: Fuki Choshun. Date: this dish probably Meiji (1868-1912) period. 903. Japanese porcelain with Japanese 'Imari' decoration. Mark: Fuki Choshun. 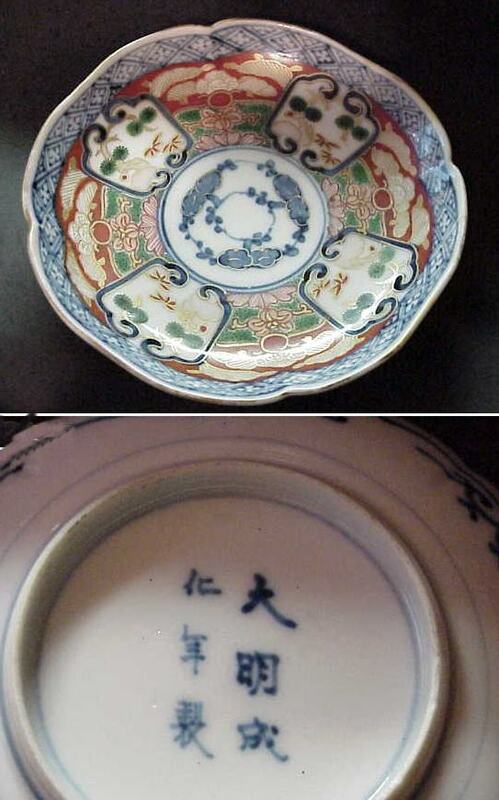 Date: this dish probably Meiji (1868-1912) period. Fu ku, common on Arita porcelain during the Edo period (1603-1867). 584. Mark: Fuku - "Happiness". Arita, Imari porcelain. Meiji period, around 1880-1900. 668. Abbreviated Hizen mark as in only the Hi (肥) part of Hizen (肥前) meaning Arita (有田) region. Usually Meiji period (1868-1912). 1474. Mark: 'Made by Hichozan Shimpo' (hi cho zan shim po zo). 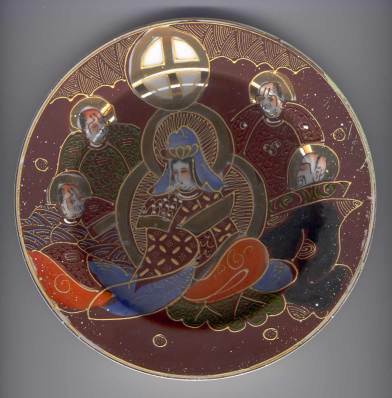 Dish decorated in Japanese Imari (Iro-e) enamels, from the Arita area in Japan. A trade mark used by Tashiro Monzaemon until c. 1900. Meiji period, around 1860-1880. 1445. Mark: Hichozan Shinpo-sei. Ewer decorated in Japanese Imari (Iro-e) enamels, from the Arita area in Japan, around (1860-1880). A trade mark used by Tashiro Monzaemon (?-1900 ). Meiji period, around 1860-1880. 1412. Mark in underglaze blu: Ken. This kanji character, ken in Japanese is from the kanji characters of kenryu-nen-sei which stands for the Chinese Qianlong period (1736-1795). Japanese porcelain with 'Imari' decoration. Late Edo period (1780-1860). 925. Mark: Nishiyama. Japanese porcelain. Arita Hasami-yaki. Date: probably 1970s or later. Early company name or trademark, in use between 1842 to 1870. Zoshuntei Sanpo means "Zoshun (shop) Sanpo Made (made by Sanpo). 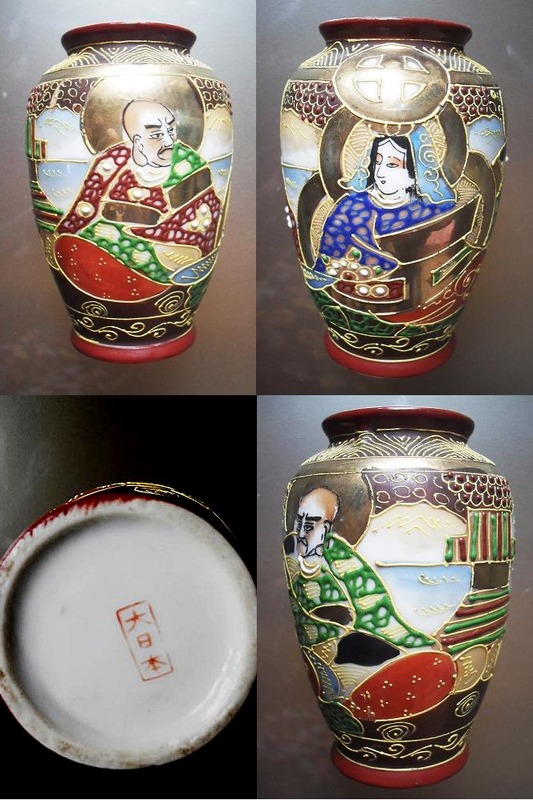 The owner was Hisatomi Yojibei Masatsune who as one of the first potters in the area of Arita and Mikawachi was granted an export permit by the Lord of the Arita Han Lord Nabeshima Naomasa (1814-1871) in 1842. This was also the first time it was allowed to put a signature on pieces exported from Arita, other than Fuku (Happiness) or various copies of Chinese reign marks. His business was succeeded by Masatsune's oldest son, Masayasu (1812-1878) and his younger brother, Yohei Masaoki (1832-1871) until Yohei's sudden death in the sea. In 1911, Masayasu's nephew, Hisatomi Kikuro (1862-1937) restored his family business with a modern factory method, but only lasted for 15 years, until 1926. 795. Mark: "Zoshuntei Sanpo Zu "Zoshun (shop) Sanpo Made (made by Sanpo) - a fictitious trade name of Hisatomi Yojibei Masayasu. 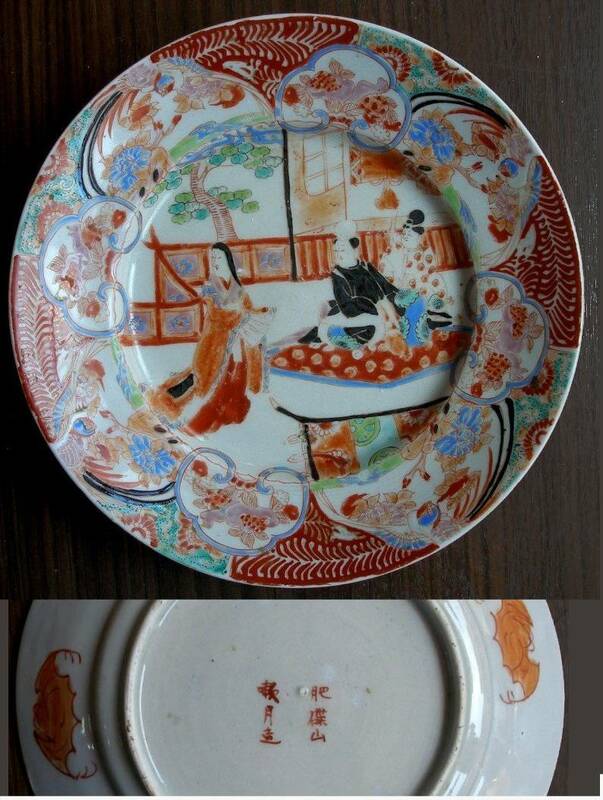 Good quality, mid 19th century, Japanese export ware with Imari style decoration. Mid 19th century. 872. Mark: "Zoshuntei Sanpo Zu "Zoshun (shop) Sanpo Made (made by Sanpo) - a fictitious trade name of Hisatomi Yojibei Masayasu. 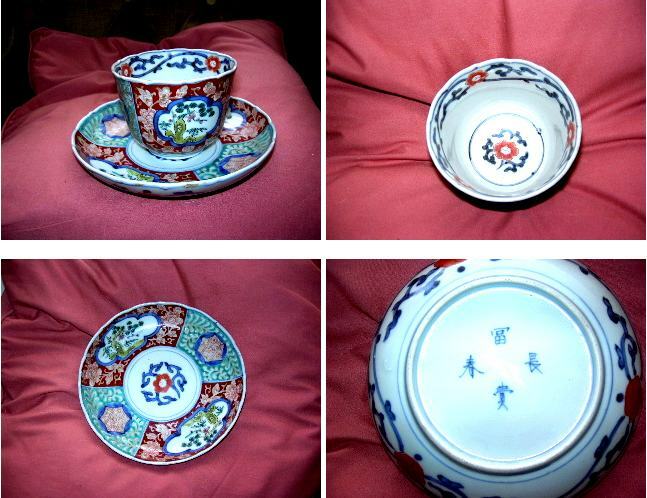 Good quality, mid 19th century, Japanese export ware with Imari style decoration. Mid 19th century. 1396. 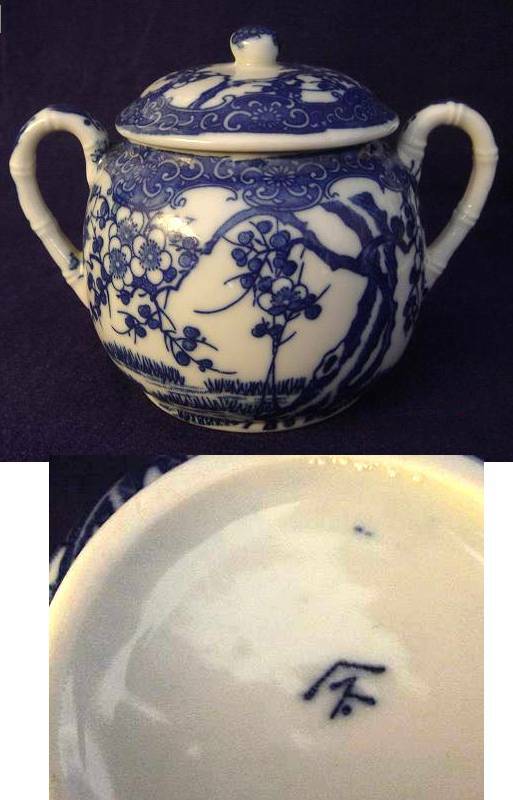 Tea cup and dish with underglaze blue and white decoration in imitation of Chinese Kangxi period (1662-1722) porcelain. Mark: "Zoshuntei Sanpo Zu "Zoshun (shop) Sanpo Made (made by Sanpo) - a fictitious trade name of Hisatomi Yojibei Masayasu. 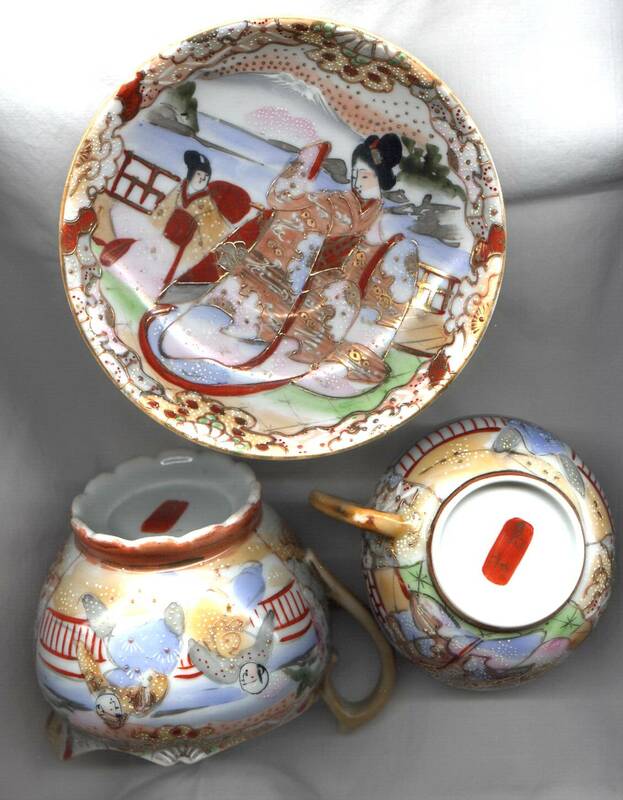 Good quality, mid 19th century, Japanese export ware. Mid 19th century. The double A mark of Ardalt A, seems to have been a trademark for tableware, dishes, jars and vases registered by ARDALT Inc. Corp., 95 Madison AVE., New York and first used in 1945. On some pieces the trademark 'Lenwile' occurs which was also registered by the ARDALT Inc., in 1945, for use on figurines and statuettes. Both marks have been used on Japanese pieces. The name Ardalt occurs also on pieces from other countries. 1095. Ardalt figurine. Probably mid 20th century. 109. ARDALT. Mid 20th century. Arnart Imports Inc. is still in operation and is currently located in 230 Fifth Avenue, New York. The company specializes in Porcelain gifts and decorative accessories. First registered trade mark is the Crown and A's mark registered April 30, 1953. A mark looking like a bee hive, was first used the last of December 1957. Both were canceled in 2001. 952. Arnart Imports Inc., mark registered in 1957. Cancelled June 6th, 2001. 953. Arnart Imports Inc., Crown and A's mark in use since April 30, 1953. Canceled February 17, 2001. 954. Arnart Imports Inc., Crown and A's mark in use since 1953 combined with the 'bee hive' in use since 1957, both canceled in 2001. 955. 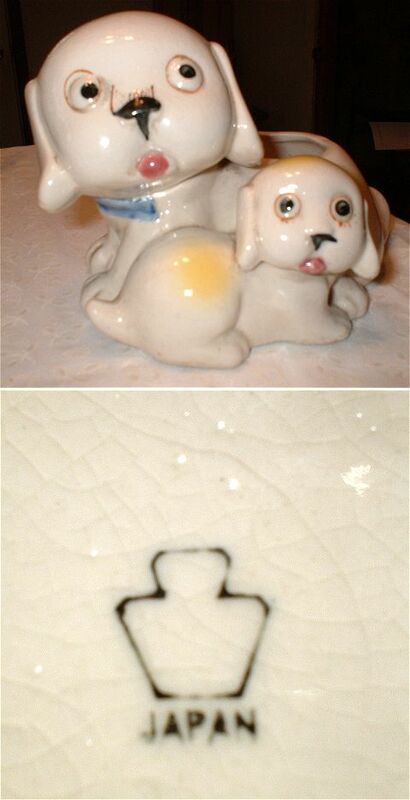 Arnart Imports Inc., Royal Carlton, was registered for porcelain tableware, in 1957; Royal Crown was registered for use on animal and bird figures 1965 - 1987. Several similar 'Royal' marks with a crown and a brand mark exists, all from the second half of the 20th century. Might be the mark of a shop or trading company that commissioned pieces for sale, and got pieces from various kilns marked like this. The mark occurs on several pieces of which some are almost identical to Kutani. Recent information has it that Bibi is the name of a family import firm that imported porcelain from Japan to Lebanon during the 1950s and 60s. This porcelain had a Bibi mark on it and was sold in Beirut. The family might also have had a porcelain import business in Palestine in the 1930s and 40s before they were forced to flee in 1947. 919. Mark "Made in Japan" over two characters "Bibi". 1373. Mark "Hand Painted" and "NIPPON" over and under the two characters "Bibi" . 431. Mark: Bijutsu Toki. Second half of 20th cent./modern. Satsuma looking crackled glaze. 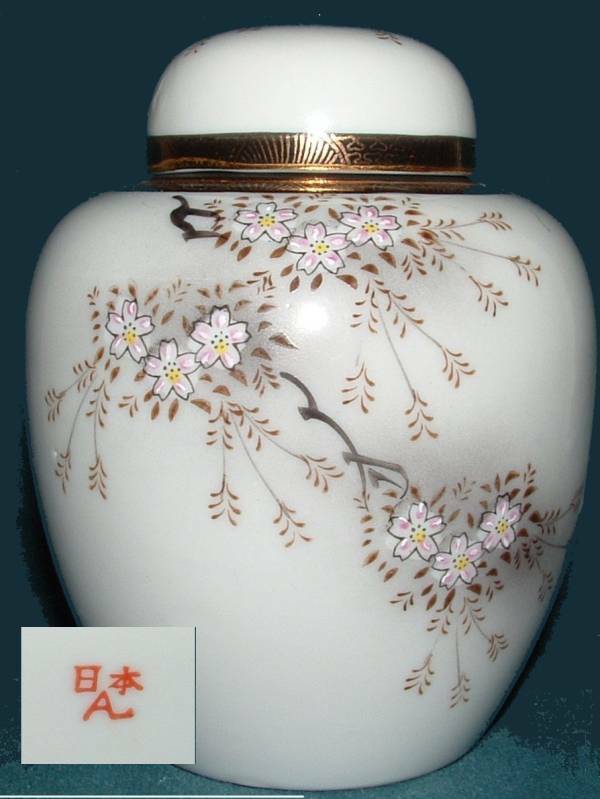 In 1924 a mark know as the "Cherry Blossom", in the shape of five "M" was sub-contracted by the Nippon Toki Kasha Company (Noritake Company) to independent companies making porcelain for export the USA Market. 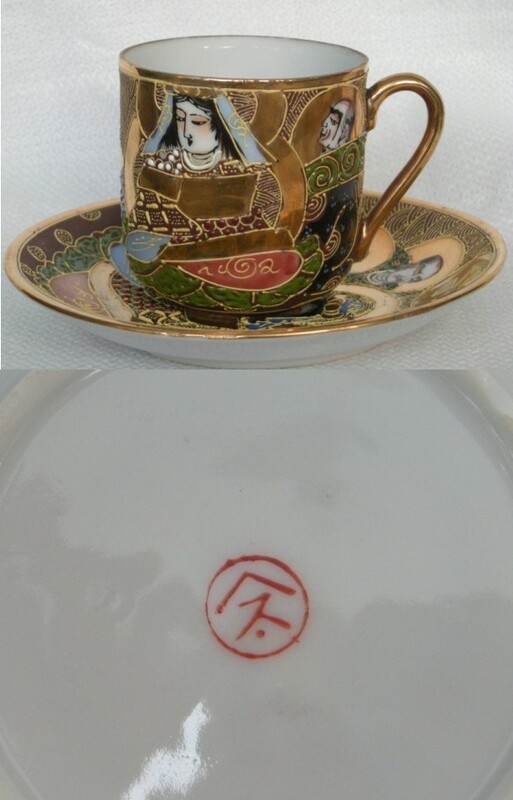 I have here collected a number of these and similar marks with the likelihood of a relation to the Noritake sales organization, the US market and a possibly date to the mid 1920s. 1088. Mark: Mt. Fuji and the Japanese characters "Nichi Hon" (Nippon) = Japan, late first half of the 20th century. 1093. Pitcher. Mark: Cherry Blossom and within Japanese characters beginning with "Naka" and second character is "Cho" or "To". It was produced for export, not in Japanese taste and is of lesser quality. Tentative dated first decades of the 20th century. 104. Mark: Cherry Blossom in the shape of five "M". Mark sub-contracted to independent companies making porcelain for the USA Market, by the Nippon Toki Kasha Company (Noritake Company). Date: c 1924. 1524. Mark: Cherry Blossom in the shape of five "M". Mark sub-contracted to independent companies making porcelain for the USA Market, by the Nippon Toki Kasha Company (Noritake Company). Date: c 1924. 722. "Souvenir - Japan", "Flower" mark in shape of five "M". Early 20th century. 527. Might be of the Hotta Yu Shoten & Co. The use of the word "Shoten" indicates the name for a shop which is selling products from its own kiln. In either case they seems to have went out of business in 1947. This mark likely to be from the 1920-30s. 824. Literally hundreds of companies produced dinnerware with European or Western style designs. 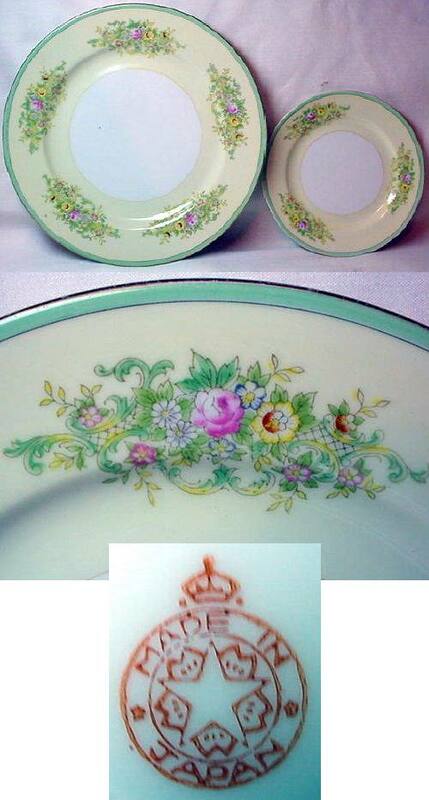 It is not a Noritake mark, but is similar in design to those made during that period. Many of these companies were in business for very short periods of time. Style suggests a post WWII date, possible 1960s. 1038. Literally hundreds of companies produced dinnerware with European or Western style designs. 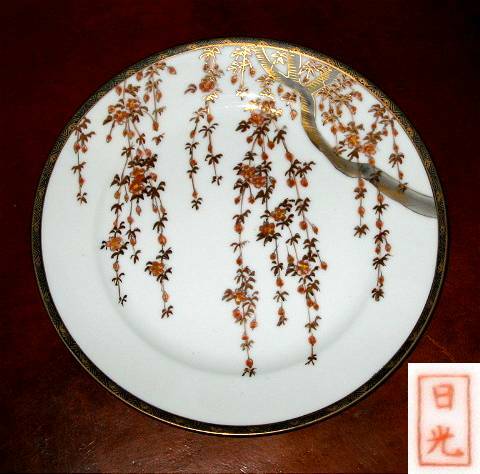 It is not a Noritake mark, but is similar in design to those made during that period. Many of these companies were in business for very short periods of time. Style suggests a post WWII date, possible 1960s. Chikaramachi, Made In Japan. In use on porcelain made at the Noritake factory, Chikaramachi branch, during 1928-1946. Mark occurs in black and red. 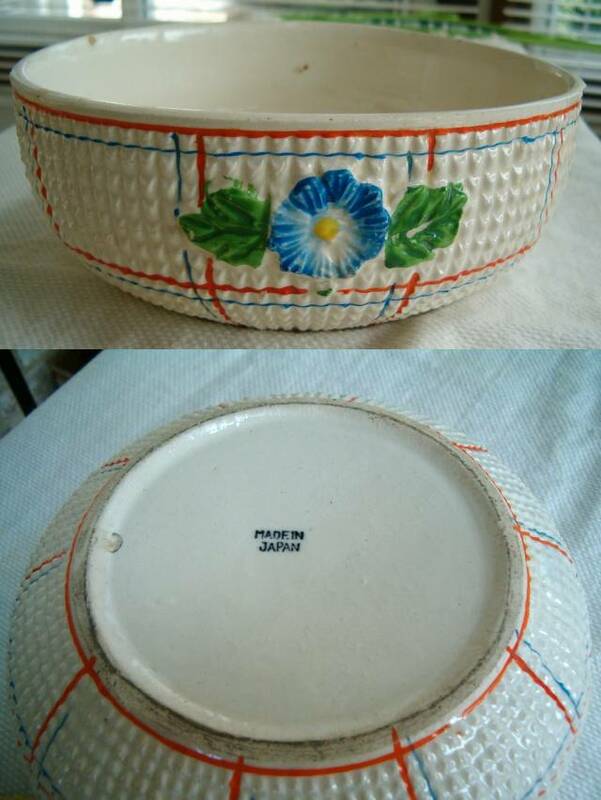 Porcelain intended for the United Kingdom market uses "Foreign" instead of Made in Japan. Same factory also used a mark with a crown inside a wreath. 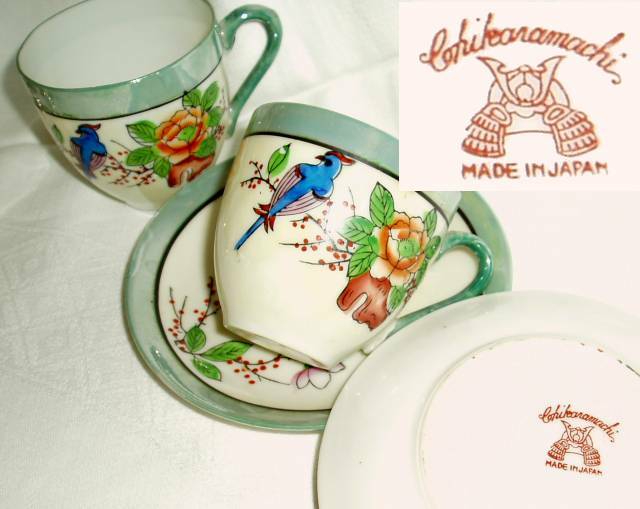 After the Noritake Morimura Gumi period that ended 1946, the factory changed name to Hinode Shokai. Dai Ichi Toki 第一陶器 (Product of the Number One Kiln) Co Ltd. It is generally accepted that marks that includes "Dai Nippon" in Japanese characters on the whole date to the Meiji (1868-1912) period, reflecting the greatly increased nationalism of that period. However, in stamped versions it also occurred on mass produced export wares well into the 1930s. 1039. Mark reads Dai Nippon Shimada Zo, and looks typical of those on 'Satsuma' but is in 'Kutani' style probably decorated in Yokohama. As for a date, in spite of the "Dai Nippon" mark that would indicate Meiji (1868-1912), this could be later though and the mark just carried over from Meiji to Taisho (1912-26). The porcelain is thus likely to be from the first decades of the 20h century. 701. Might read Dai Nippon Zao - "Great Japan Made". If so the "pon" character is very simplified in this particular case. It is generally accepted that marks that includes "Dai Nippon" in Japanese characters on the whole date to the Meiji (1868-1912) period, reflecting the greatly increased nationalism of that period. Possibly Kutani, 1900-1920. 1218. Mark: Dai Nippon. 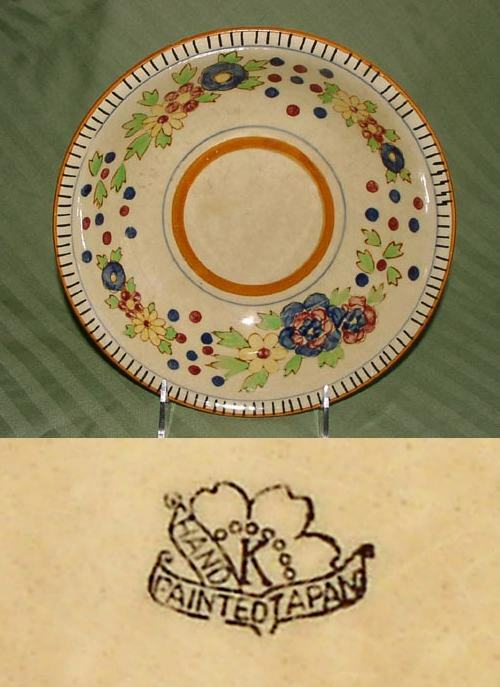 Plate in Satsuma style but on porcelain, from around 1935. The decoration is of Kannon with a rakan on each side of her. This type of wares made heavy use of moriage or raised enamels. 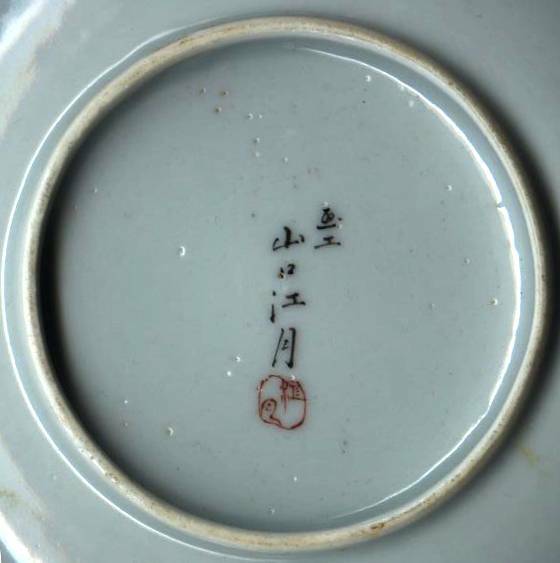 The mark on the back of the plate is a generic one meaning Dai Nippon or "Great Japan". These wares were mass produced for export during the Taisho (1913-1926) & early Showa (1926-1988) period. 1230. Mark: Dai Nippon. 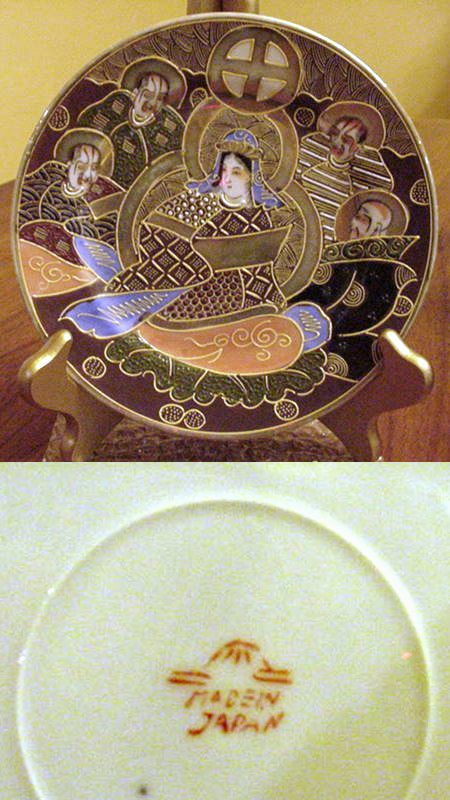 Plate in Satsuma style but on porcelain, best guess, the 1920s. The decoration is of Kannon with two rakans on each side of her. Displayed above the figures is the cross in circle mon of the Shimazu family crest. This type of wares made heavy use of moriage or raised enamels. The mark on the back of the plate is a generic one meaning Dai Nippon or "Great Japan". 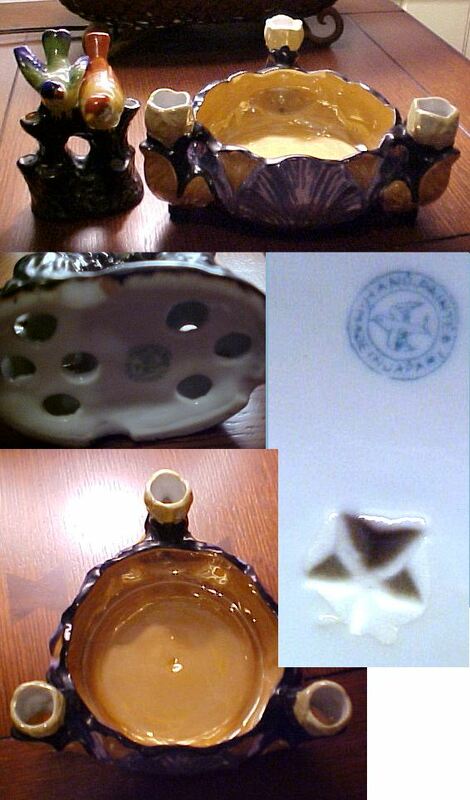 These wares were mass produced for export during the Taisho (1913-1926) & early Showa (1926-1988) period. 1359. Vase. Mark: Dai Nippon. 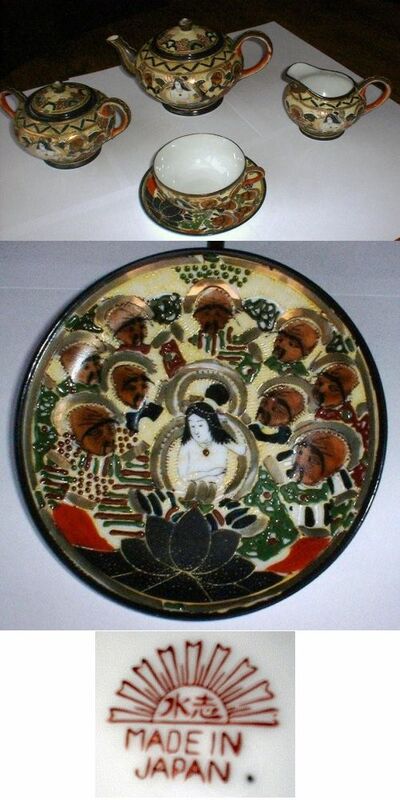 Decoration in Satsuma style but on porcelain, best guess, early 1920s from its collection context. The decoration is of Kannon with two rakans, one on each side of her. Displayed above the figures is the cross in circle mon of the Shimazu family crest. This type of wares made heavy use of moriage or raised enamels. 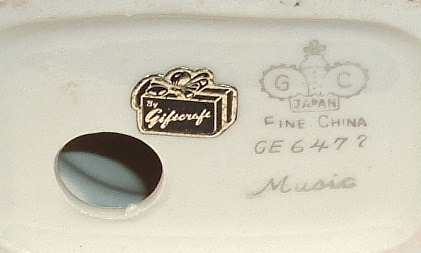 The mark on the back of the plate is a generic one meaning Dai Nippon or "Great Japan". These wares were mass produced for export during the Taisho (1913-1926) & early Showa (1926-1988) period. 1245. Mark: "Dai Nichi Hon/Dai Nippon" (Great Japan), mid 20th century. This marks however printed gives an example of marks that includes "Dai Nippon" in Japanese characters occurs well after the Meiji (1868-1912) period. 1382. Mark: "Dai Nichi Hon/Dai Nippon" (Great Japan), mid 20th century. This marks however printed gives an example of marks that includes "Dai Nippon" in Japanese characters occurs well after the Meiji (1868-1912) period. According to family traditions this set was acquired as a gift in the early 1940s. 599. Mark: Dai Nippon Ji mei or ni mei, Tsukuru - "Great Japan ... Made". It is generally accepted that marks that includes "Dai Nippon" in Japanese characters on the whole date to the Meiji (1868-1912) period, reflecting the greatly increased nationalism of that period. Mark from tea set which was bought probably in Czechoslovakia between 1915 and 1935, made from a fine, almost translucent porcelain. Date: Early 20th century. 694. Mark: Dai Nippon 'Choko sei' or 'Nagae sei' "S.N. ", early 20th century. 293. Mark: Ei, in Chinese: "Yong" (Eternity). The Eiraku lineage were important and historically significant potters in Kyoto from the 18th Century right through to the present day. In Chinese this mark would read same as the Ming emperor Yongle (1404-1424). 1246. Mark: ei and raku, Eiraku lineage of potters of Kyoto or the studio. Silver or gold work over a red enamel ground is quite typical for Meiji (1868-1912) period Eiraku pots. 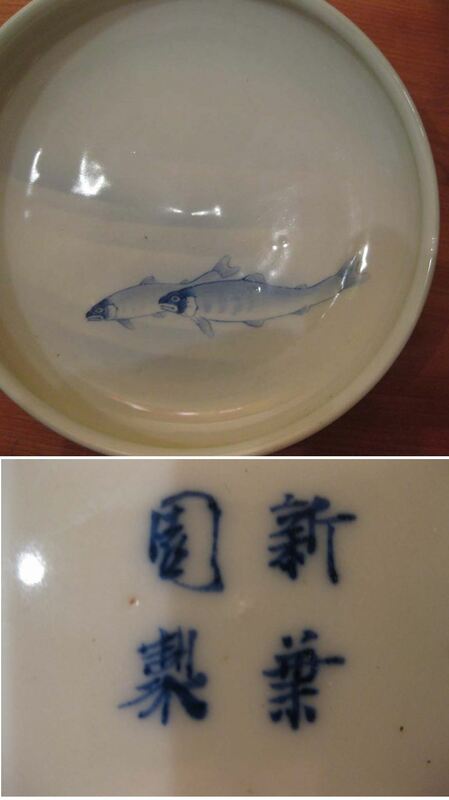 This bowl probably late Meiji or Taisho (1913-1926). 1249. Mark: ei and raku, Eiraku lineage of potters of Kyoto or the studio. Silver or gold work over a red enamel ground is quite typical for Meiji (1868-1912) period Eiraku pots. 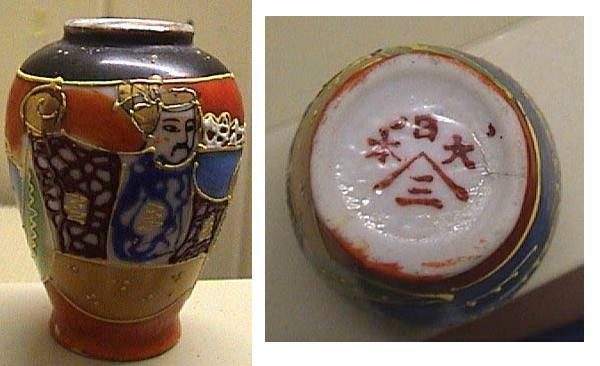 Eiwa Kinsei appears to be mostly an export ware dating from the 1950s and later. 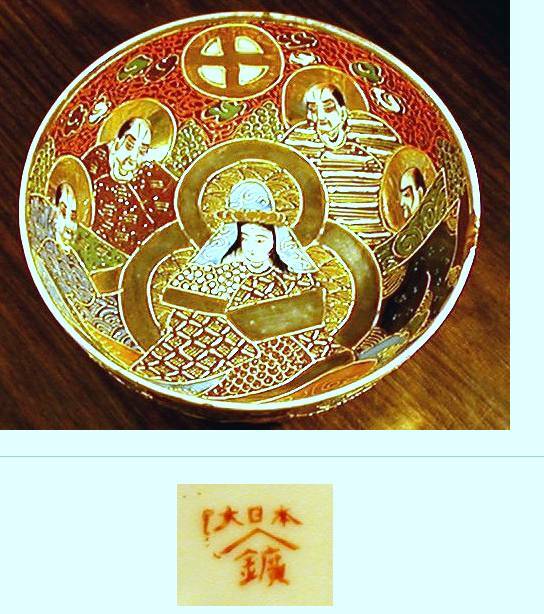 The oldest marks are black and gold marks found on lithophane Geisha wares. Blue and red seal marks occurs later. 634. Mark: Japanese reading: Eiwa Kinsei, "Eiwa (name) Respectfully Made". Probably last quarter 20th century. 799. Eiwa Kinsei, "Eiwa (name) Respectfully Made". Probably last quarter 20th century. 1535. Mark: Japanese reading: Eiwa Kinsei, "Eiwa (name) Respectfully Made". Probably last quarter 20th century. 1536. Mark: Japanese reading: Eiwa Kinsei, "Eiwa (name) Respectfully Made". Probably last quarter 20th century. 1557. Mark: Japanese reading: Eiwa Kinsei "Eiwa (name) Respectfully Made". Second half 20th century, likely around 1970s. 804. 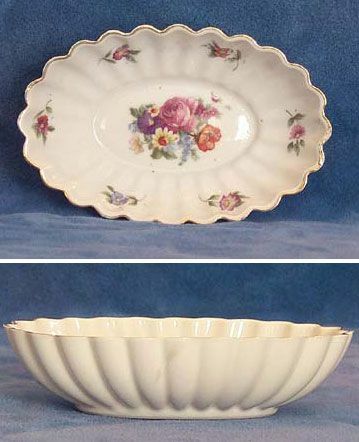 Japanese porcelain, "Fine China Japan, "Golden Rose" (pattern), "MSI". Retro style decoration, later part of 20th century. 'Fine China' seems to be used consistently as a brand name under which several patterns are/were sold such as Golden Rose, Platinum Rose, Golden Wheat, Platinum Wheat, Cherry Blossom, English Garden, and St. Regis. The M$ is referring to the designer Max Schonfeld. 805. 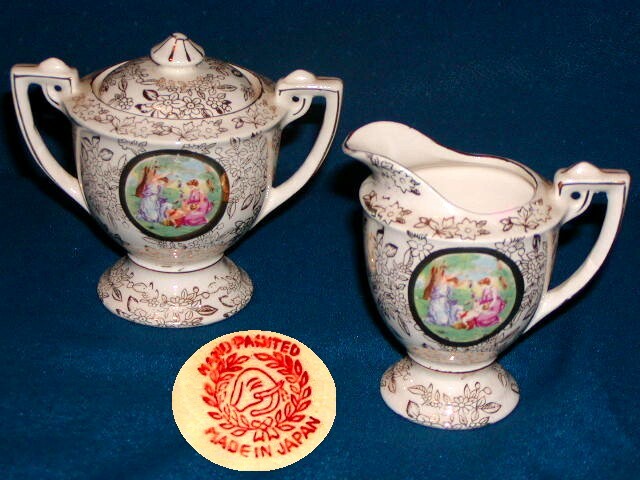 Japanese porcelain, "Fine China Japan, "Platinum Wheat" (pattern), "MSI". Retro style decoration, later part of 20th century. 'Fine China' seems to be used consistently as a brand name under which several patterns are/were sold such as Golden Rose, Platinum Rose, Golden Wheat and Platinum Wheat. The M$ is referring to the designer Max Schonfeld. 807. 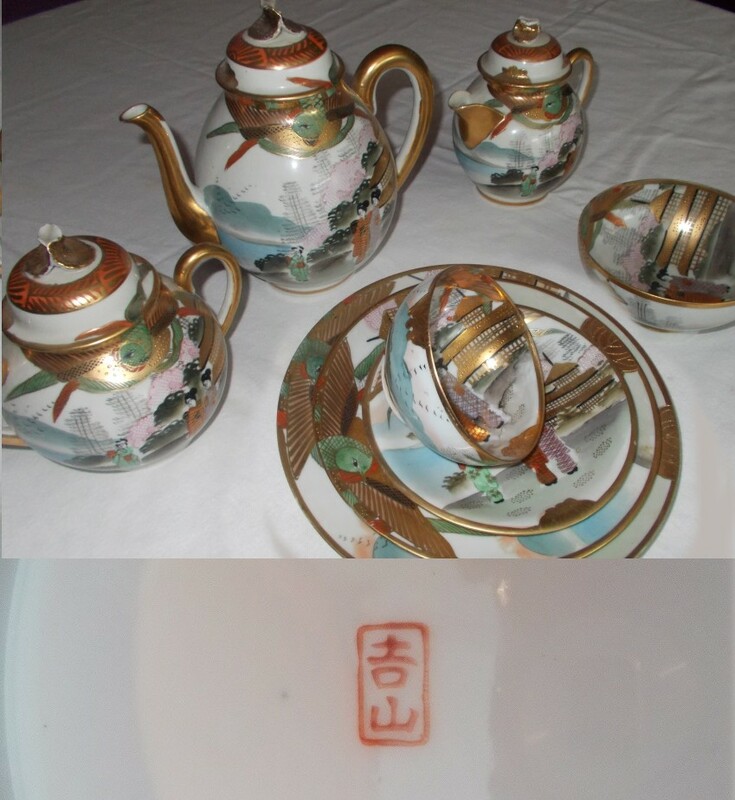 Japanese porcelain, "Fine China, Japan, "1221", "English Garden" (pattern), Retro style decoration, later part of 20th century, tentatively 1970s. 806. 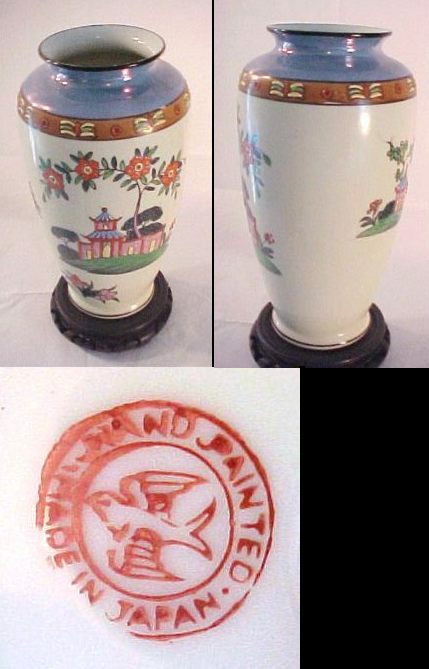 Japanese porcelain, "Fine Porcelain China, Japan, "W", "Diane" (pattern), Retro style decoration, later part of 20th century, tentatively 1970s. Toronto based Canadian company established in the 1940s and still active. Import and sells gift wares from all over the world. Early products seems to be mostly Japanese. Canadian trademark GIFTCRAFT filed 1941-11-03. 793. Mark: "G" in a wreath. This marks also occur with the addition of "Occupied Japan", while we can assume this mark dates to the early to mid 1950s. 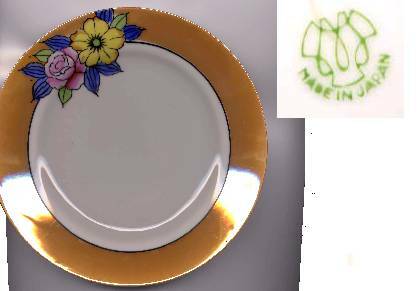 A friendly reader, Rosalie Babineaux, have volunteered the information that this marks is a Noritake contract mark for Giftcraft Importers of Toronto Canada in operation during the 50s and 60s. 415. Mark G C (Gift Craft). Mid 20th century. 632. Mark G C (Gift Craft). Mid 20th century. 1223. Mark G C (Gift Craft). Mid 20th century. 1333. Vase. Second half 20th century. 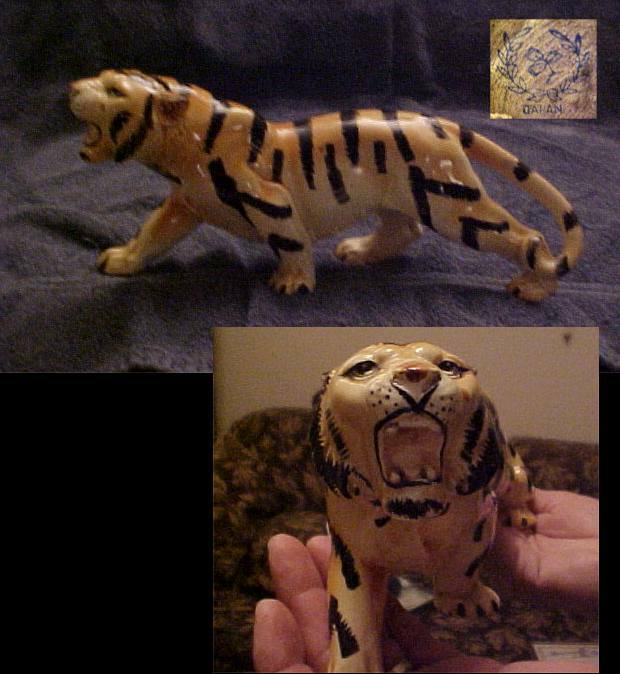 Mark is Ge To Art (Artistic) Pottery. Probable manufacturers mark. Date: Second half 20th century/Contemporary. 753. Mid 20th century, 1950-60s. 759. "GOLDCASTLE MADE IN JAPAN", Mid 20th century, 1950-60s. 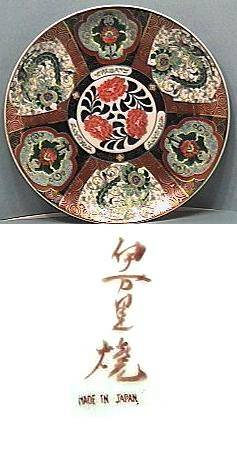 The Gold Imari logo is a trademark of the Yazaemon family kiln founded in 1804. After many ups and downs including fires, bankruptcy, and name changes, it became the Arita Busson Co. in 1953. The trademark was created in this era. 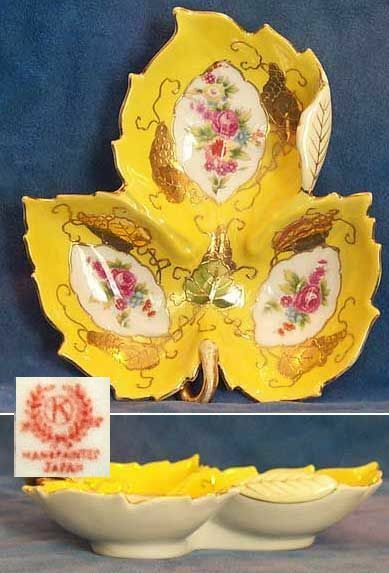 The Word Mark 'GOLD IMARI HAND PAINTED' was first used in the US December 1, 1959. The applicant was Arita Bussan Co., Ltd. Corp. Japan No. 8, 3-Chrome Iida-Machi, Higashi-Ku, Nahoya, Japan. In 2007 they became the Arita Seiyou Co., Ltd, and in 2016 they became the Arita Porcelain Lab, Inc. The US patent Office mark registration was abandoned October 29, 1984, however they are still using the trademark. The company apparently stopped exporting in 2007 and are now only selling domestically in Japan. 691. Mark: Gold Imari. Mid 20th century. 596. "L'amour China - Hand Painted". This mark occur also with "Made in Japan" under it. Most likely dating to the 1940-50s. 720. "Hand Painted - Nippon - "Japan". Date probably 1920s. 688. IE&C Co (?) - Unknown mark. Early to mid 20th century. 815. Mark: "NIPPON HAND PAINTED", Blue pagoda. Date hard to suggest. The use of NIPPON was generally discontinued after 1921 but this mark could be later than that. 1353. "Hand Painted - "Japan". Date probably 1930s. 938. 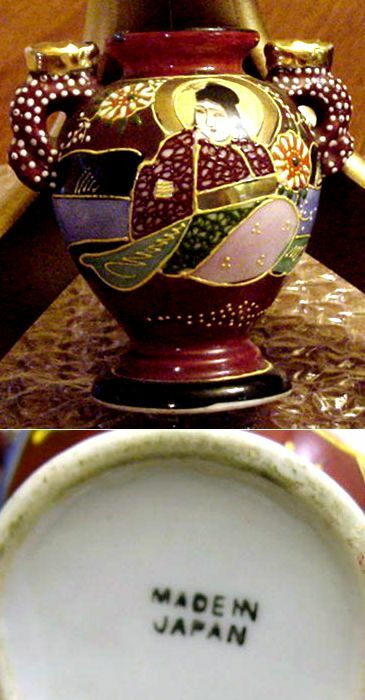 Sugar bowl with celadon glaze and enamels. Mark: H.SAJI JAPAN Dai Nippon Sa Ji Sei = Great Japan, Saji Made. "Saji" seems to be a name, one possibility is that it is just referring to the Japanese name for Seji" = Celadon. Best guess from looking, is a Seto/Nagoya or perhaps Yokohama product. Regarding date, it is generally accepted that marks that includes "Dai Nippon" in Japanese characters on the whole date to the Meiji (1868-1912) period, reflecting the greatly increased nationalism of that period. In this case a likely period is 1910-30. 1334. Tureen. Second half 20th century. Mark is I Man Ri, where Man = 10,000 and Ri is a measurement of distance equal to almost 3 kilometers. I pronounced "Ee" means you or another, kind of vague. It is also a family name. There are noway to know what this mark actually is referring to, being it an achivment, a person or a company. Date: contemporary / second half 20th century. 421. Mark: Nippon Yokohama Imura tsukuru. 1. Mark: The kanji character inside the fan is Izumi. The 2 characters outside the fan are read from left to right as Hihon (Nippon) = Japan. Date: likely around 1900. 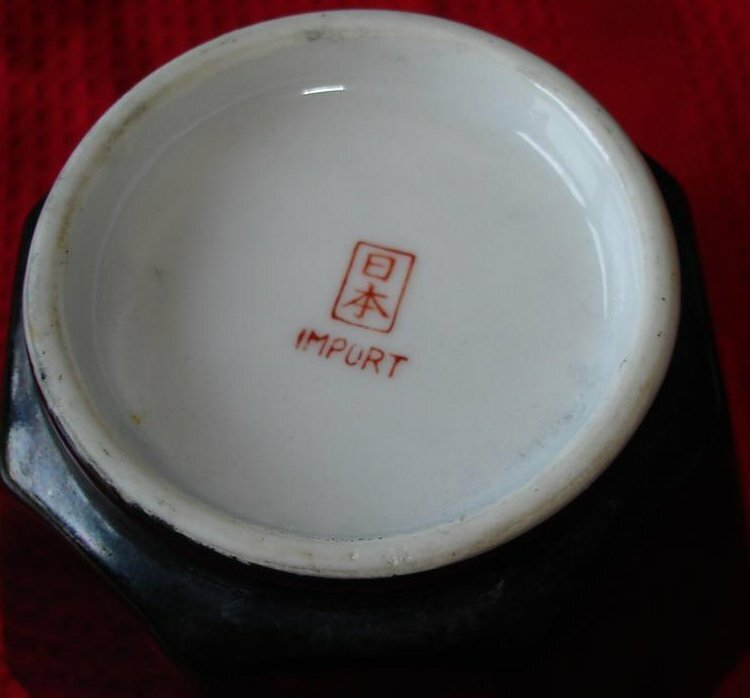 Marks on export porcelain: In 1891 the McKinley Tariff Act was instated, requiring items imported into the United States to be marked in English with the country of origin. The name "Nippon" was chosen for items coming from Japan. (Nippon is the Japanese name for Japan.) In 1921, the official country of origin name requirement was changed to "Japan", thus creating a defined time period 1891-1921 in which wares were marked Nippon. 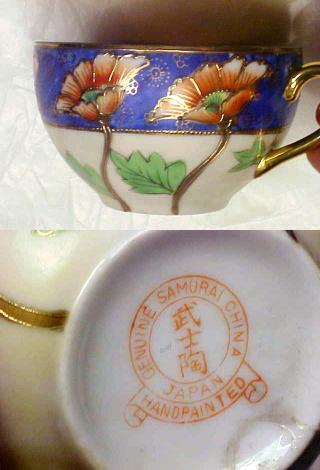 Previous to 1891, items were either not marked at all, or marked with Japanese characters. 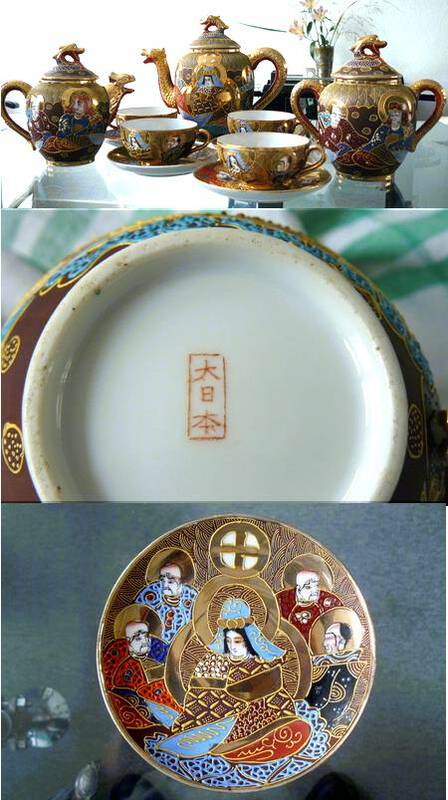 During the period 1921-1941 porcelain should be marked "Japan" and roughly after 1941, marked "Made in Japan", though numerous exceptions appears to occurs. 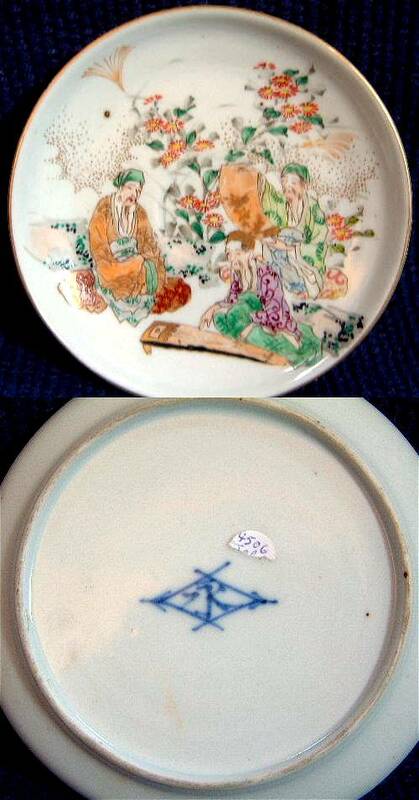 Pieces marked with JAPAN or MADE IN JAPAN in plain text without any company marks, in general date to the period immediately after the second WW. Some come with the addition of OCCUPIED JAPAN. 725. "Made in Japan / Occupied". Date 1945-52. 986. 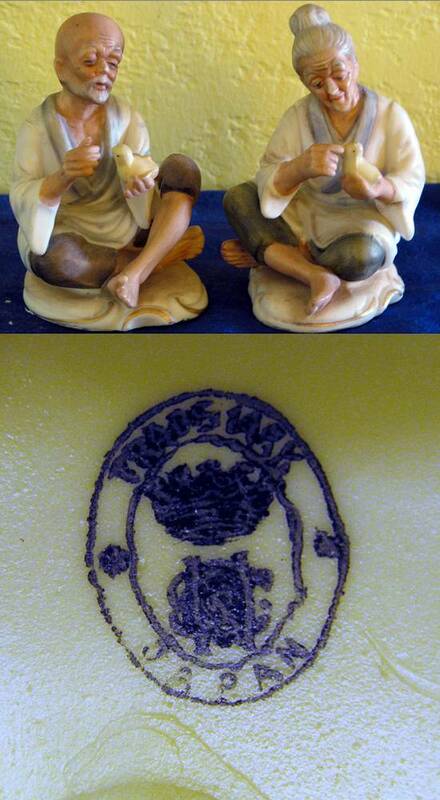 Mark: "Made in Japan", Japanese lustreware figure, probably c 1950. 800. Unidentified mark on pottery planter, 1950s ? 59: The two red characters are: Bi jutsu = "beautiful artwork" which are probably a brand name or product line. Decoration in traditional "Imari" style. The three black vertical characters read IMARI. Modern, late 20th century. 608: The two red characters are: Bi jutsu = "beautiful artwork" which are probably a brand name or product line. Decoration in traditional "Imari" style. The three black vertical characters read IMARI. Modern, late 20th century. 679. Decoration in traditional Japanese "Imari" style. Modern, late 20th century. 482. Decoration in traditional Japanese "Imari" style. Modern, late 20th century. Japanese contemporary, factory made porcelain ware. Mark unknown but tentatively translated to Jitsu to (true porcelain). 1512. Mark: Jitsu-to, True porcelain. Tentative translation. Japanese porcelain, unknown factory. 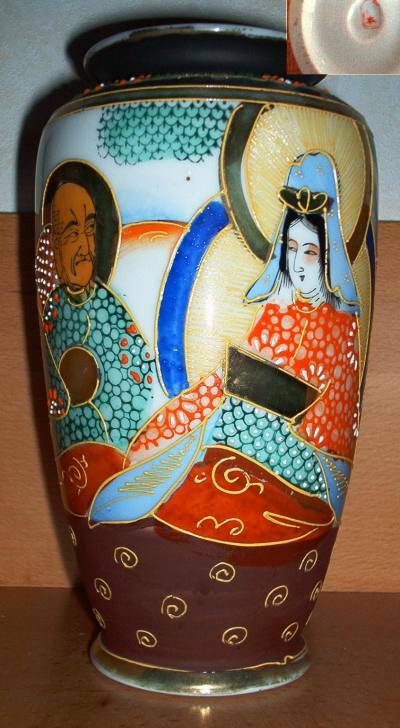 "Juzan was the family name and had their own kiln, made pottery for different companies. The Juzan kiln is famous for Arita ware of which some are marked Kutani Juzan". There also appears to be three "Juzan-gama". One is Kutani ware, the other one is Koishibawa ware, one more is Takatori ware. 748. Capital "K" in a wreath. Mid 20th century. 877. Mark: "K", "Hand painted Japan", ( unknown ) K could possible stand for Kyoto. Tentative date: 1920-40. 896. Mark: "K", unknown. Tentative date: c. 1920-50s. 941. Mark: "KB Japan", Date: probably c. 1950. 724. "K.S. - Hand Painted, Made in Occupied Japan". Date 1945-52. 699. Mark: Dai Nippon Yokohama Kawata sei, Early 20th century. It is generally accepted that marks that includes "Dai Nippon" in Japanese characters on the whole date to the Meiji (1868-1912) period, reflecting the greatly increased nationalism of that period. 1282. Bowl. Mark: Nippon Yokohama, Kawato Zo, (decorated by Kawato), Kutani influence. Size: Diameter 6" / 15 cm across, height 3" / 7.5 cm. Date Taisho to early Showa. 27. The right hand character is Kichi, the left hand character is Sho. Read from right to left they read Kissho = Lucky omen. Small family kiln in Arita. Established in 1951 by Kitagawa Ihei with his 5 sons, after having worked as a free lance since 1913. The kiln is still in business today. 1083. Mark: Kozan Gama, meaning the Kozan kiln. Last quarter of 20th century. Kiln still in operation. Mino pottery, made in Mino area in Gifu prefecture, Japan. The third (left) says gama which means 'kiln'. Marks that includes this character are usually contemporary. 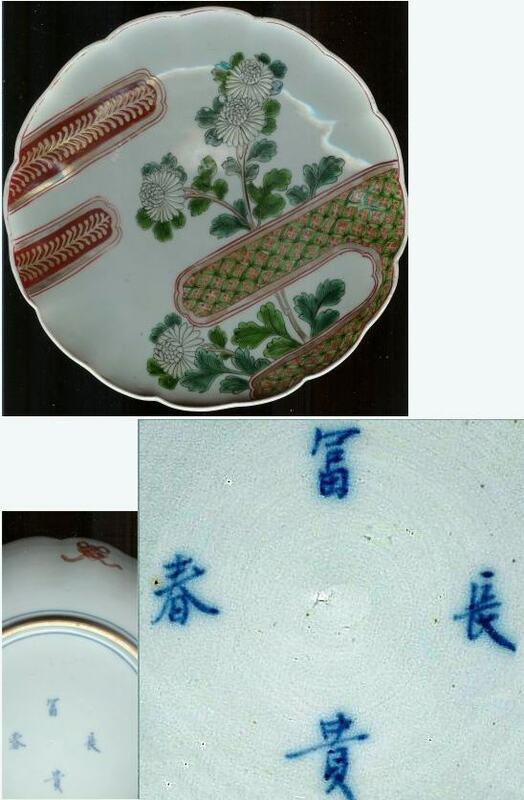 These marks might or might not have been manufactured by the Noritake company. More than 400 marks are suggested to have been used by Noritake alone. 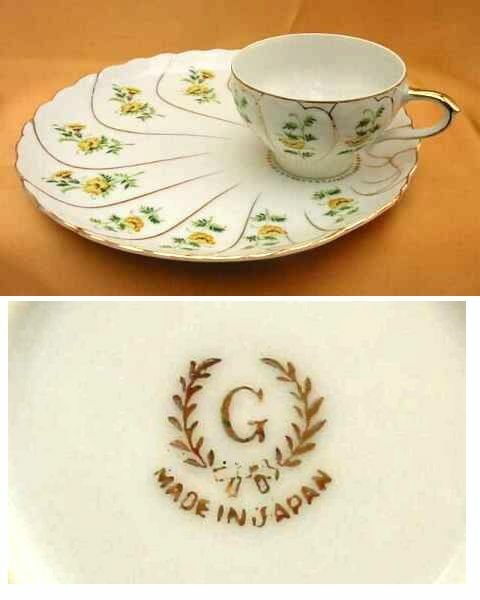 Most pieces marked Nippon also seems to have been manufactured by Noritake. 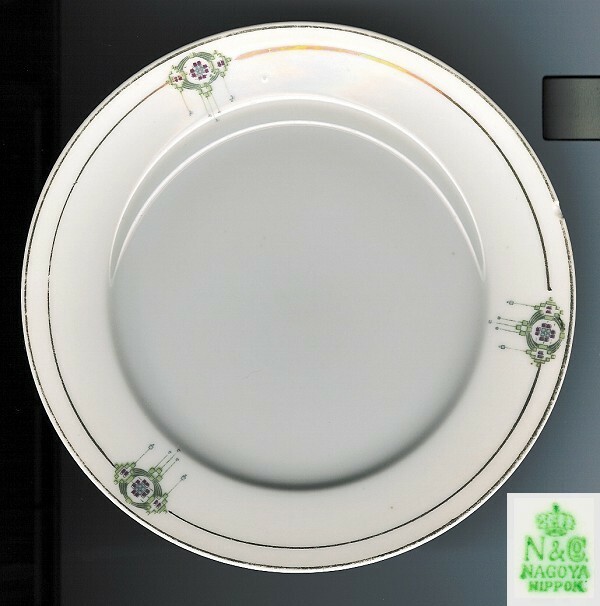 For a limited list of known Noritake backstamps, see the separate Noritake section. 11. MARUKU CHINA, Japan, Moriage dragon ware typ of porcelain. Marks featuring a crown like this, on the whole seems to date to the period immediately after the second WW, i.e. late 1940s-early 1950s. 882. Mark: Matsubara. Tentative date around 1930s. 1381. Mark: Made in Japan, Matsueda. Tentative date 1950s or later. 730. Mark: Dai Nippon Matsukawa. It is generally accepted that marks that includes "Dai Nippon" in Japanese characters on the whole date to the Meiji (1868-1912) period, reflecting the greatly increased nationalism of that period. 982. Mark: Matsumura zo. Tentative date given raised enamels and yellow/pink enamels probably late Taisho into early Showa, or around 1920s. 1140. Vases. Mark: Matsumura Zo or "Made by Matsumura". They are in a style often seen in Yokohama decorated pieces and have some Kutani influence, but Matsumura is a relatively common name. 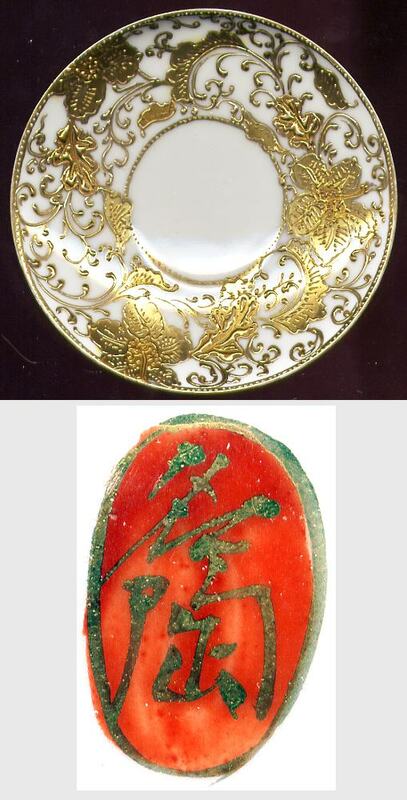 Tentative date given raised enamels and yellow/pink enamels probably late Taisho into early Showa, or around 1920s. 1316. Mark: Nihon Yokohama - Matsushita No Sei . 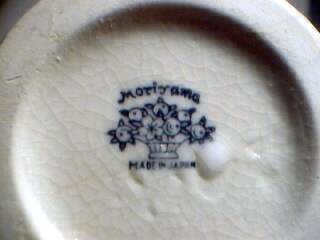 "Japan, Yokohama, Made by Matsushita". 893. Mark: Mineta. Tentative date: c. 1910-20s. 580. Mark: Mokusen. Tentatively dated second half of 20th century. 1509. Mark: Mokusen. The seal mark on the side, suggested to be read either as Sei-yo or Sho yo. On the base a paper label saying 'Shirokiya', currently a Honolulu department store with a long Japanese history. The vase tentatively dated second half of 20th century. Moriyama Pottery was located in MoriMachi in Shizuoka prefecture. Moriyama Pottery was established in 1911 by Hidekichi Nakamura who was taught pottery making by Seison Suzuki. There are currently four studios continuing the Moriyama tradition in and around Morimachi and they are Seison, Seizon, Nakamura and Tame. There seems to be two primary stamps: one appears to be a crown with a wreath of leaves similar to the wreath found on the Noritake stamp. This stamp is marked "Moriyama Hand Paint Japan." The other is a bouquet of flowers and is marked "Moriyama Made in Japan." The MM MARK, stands for 'Moriyama Morimachi' and has been referenced to the Moriyama Factory at Morimachi Shizuoka Prefecture Japan. 388. Moriyama Mori-machi. The porcelain seems like early to mid 20th century. Thanks to Patricia Thompson dated to "somewhere between the years of 1926 & 1929". 402. Moriyama Mori-machi. The porcelain seems like early to mid 20th century. Thanks to Patricia Thompson dated to "somewhere between the years of 1926 & 1929". 696. Moriyama Mori-machi. The porcelain seems like early to mid 20th century. Thanks to Patricia Thompson dated to "somewhere between the years of 1926 & 1929". 1069. Moriyama Mori-machi. The porcelain seems like early to mid 20th century. Thanks to Patricia Thompson dated to "somewhere between the years of 1926 & 1929". Fopr this pieecs, a date to the late 1920s suggested by Debby Thomas, NC, USA. 747. "NTC", Mid 20th century. 887. Japanese porcelain. Possible Nagoya (Mid Japan Seto/Nagoya/Kutani area) early 20th c.
In 1908 Nagoya Seito Sho Company was founded by Kotero Asukai, former employee of Noritake. Other Noritake artisans were soon to follow to the new company why this porcelain might bear a close resemblance to Noritake porcelain. 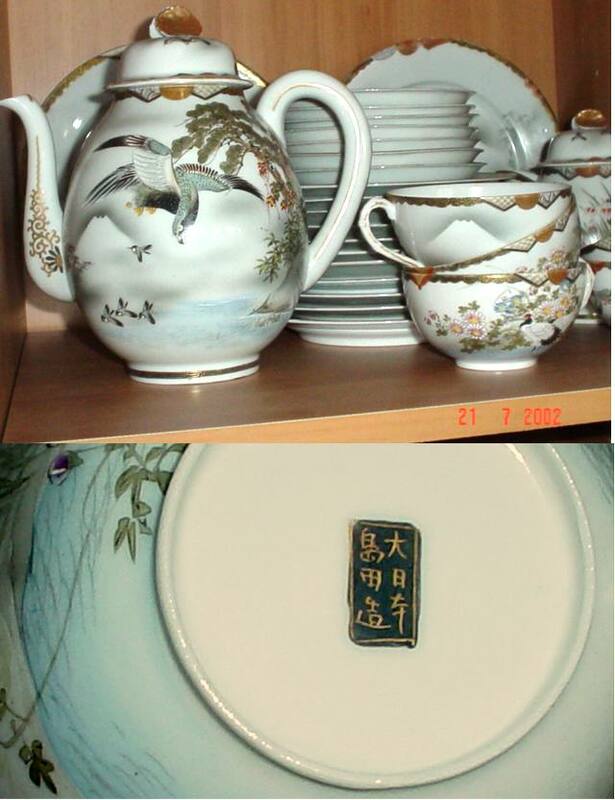 Their porcelain was also sold as Meito China. During the WWII the company was sold and the name changed to Narumi Seito Sho. The Meito China mark continued to be used after WWII with variations in the crown logo mark. 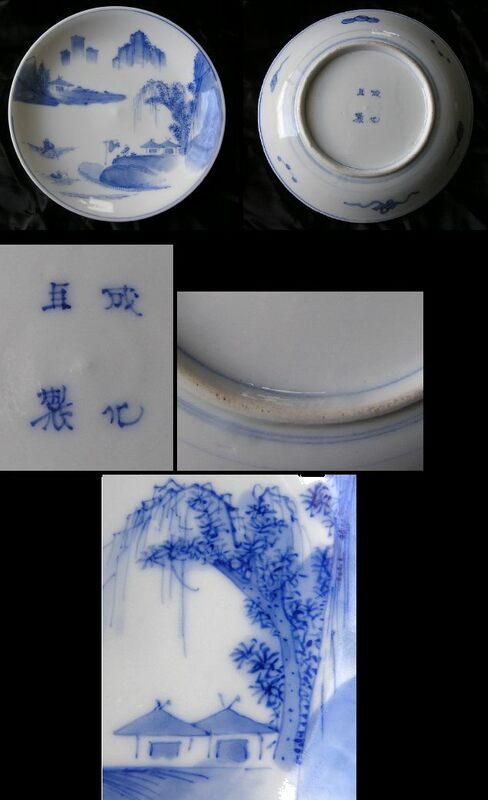 Some porcelain with Meito China marks are found with the addition "Made in occupied Japan". 1470. Nagoya Seito Sho. Tentative date 1910-30. The mark Neifu (Ch.) appears on Chinese porelcelain from the Kangxi period and onwards. 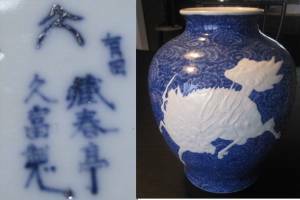 This mark is a copy of Chinese Bleu de Hue (Glossary) porcelain for the Vietnamese market. 1278. Dish. Mark: Neifu (Ch.). 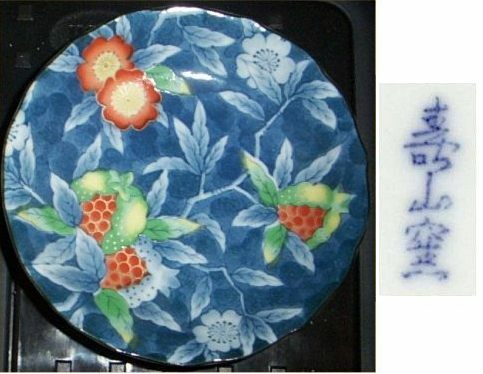 Japanese transfer printed copy of Chinese export porcelain intended for the Vietnamese market. Date 1935-45. 1374. Dish. Mark: Neifu (Ch.). 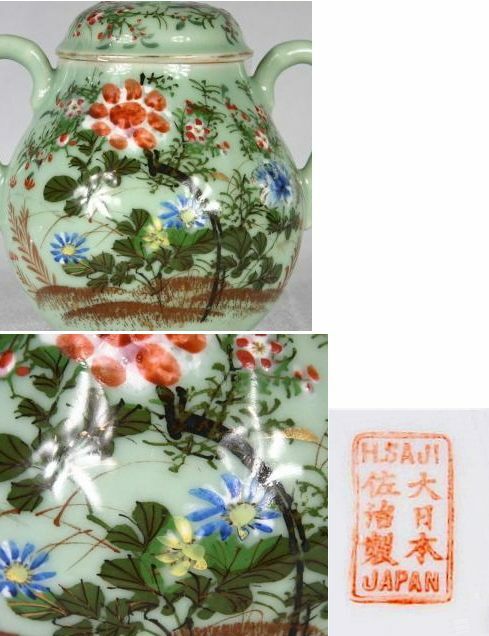 Japanese transfer printed copy of Chinese export porcelain intended for the Vietnamese market. Date 1935-45. 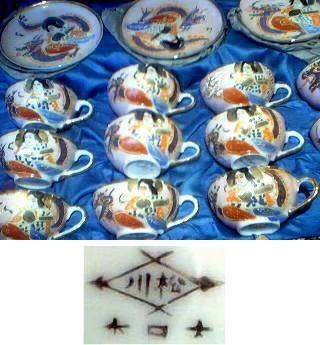 The porcelain is probably bought directly in Japan, since there are no western characters in the mark. The reading of this combination is nikko (sunlight/sunshine). Top character can be read as Nichi, or jitsu. The bottom character can be read as Ko meaning light or shine. If read alone day or sun are the common meanings, combined it is Nikko. 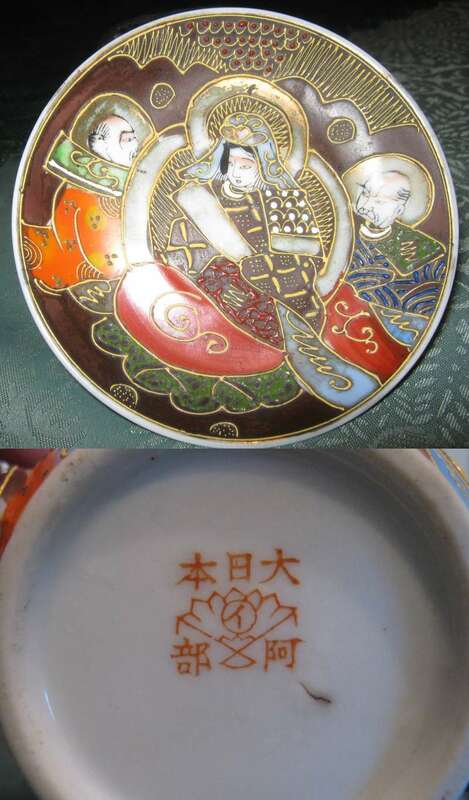 Nikko produced Satsuma wares as well as porcelains. 811. Japanese porcelain. Mark "Nikko". Most likely dating to the 1930s, or possibly the mid to late 1920s. 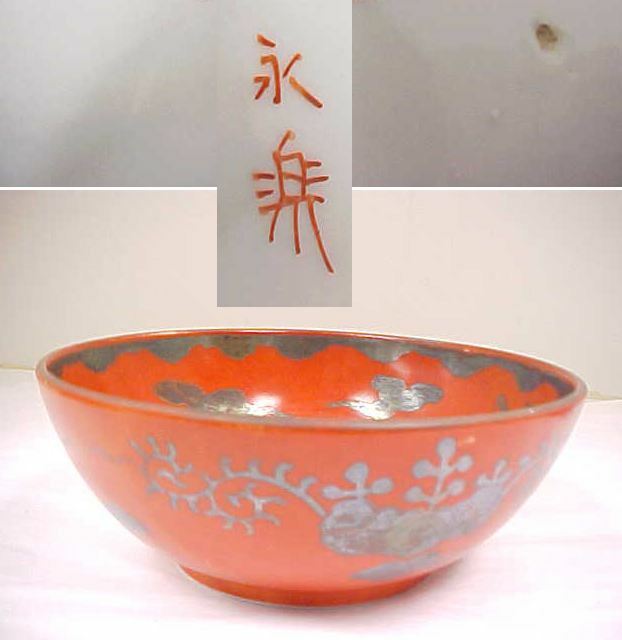 The style of pattern design is Satsuma influenced (probably from Kyoto, not Kyushu) based on the way the gilding is applied, the design of the rim, the color of the rim ground and from the way a Satsuma trained artists portrayed weeping wisteria (a favorite of Satsuma floral designs). 1479. Japanese porcelain. Covered, two-handled soup bowl. Mark "Nikko". Most likely dating to the 1930s, or possibly the mid to late 1920s. 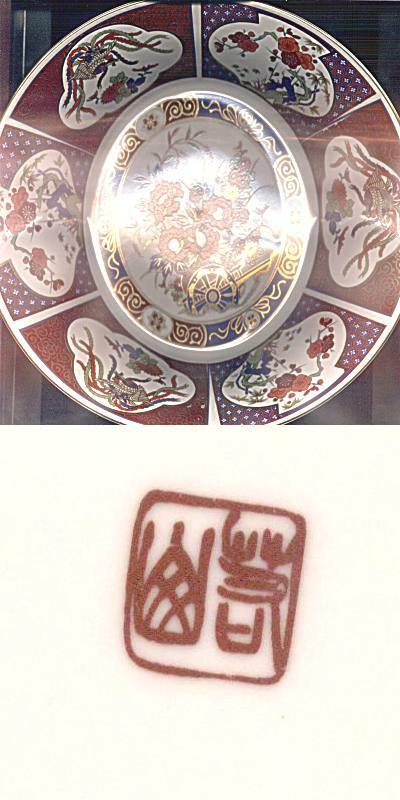 In the round example which was on the base of the bowl, the character is abbreviated to ko - light. The word "Nippon" in western characters means "Japan" and occurs on most Japanese wares from around 1890 until the early 1920s. From 1891 imports to America were required to be marked with the country of origin, in western characters. Thus Japanese exports (to America) were marked with "Nippon" in English from this date to 1922, when the requirement was changed to that the word "Japan" should be used. These are the so-called "Nippon wares". However, the rule doesn't apply in other countries nor always in America because sometimes paper labels and the like was used. So while finding a back stamp saying "Nippon" is a useful dating aid its absence is not determinative. 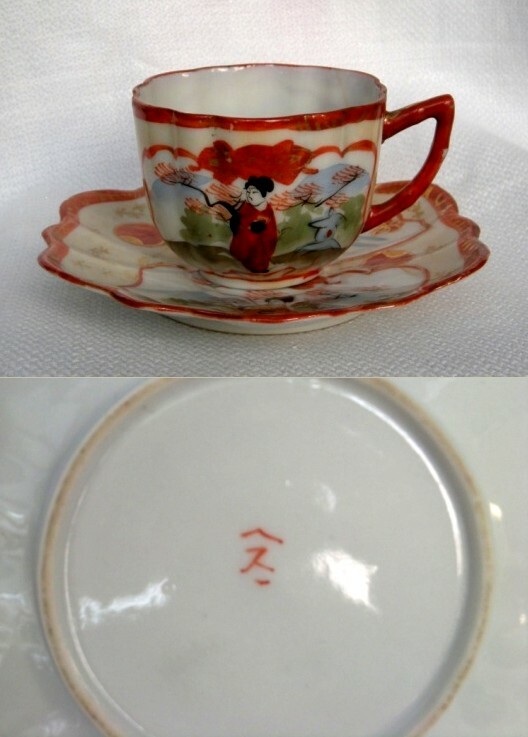 Regarding 'Nippon' marked porcelain, wares marked 'Japan' or 'Made in Japan' have not been as desirable as those marked 'Nippon'. 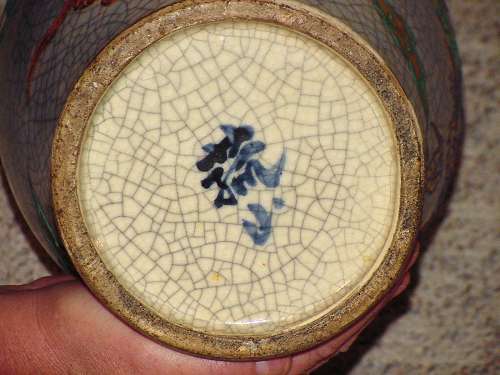 Particularly in the US, Nippon marked pieces have always brought a large premium over those marked Japan or Made in Japan and certainly more than unmarked wares. This is true even for pieces of similar quality. 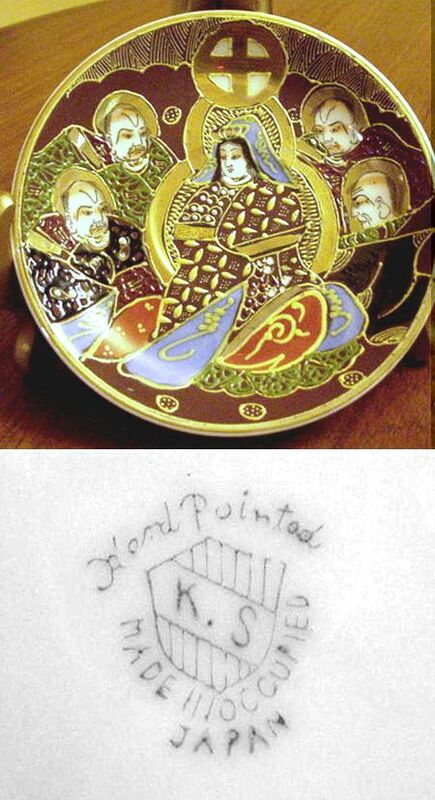 In the 1960s, collector ranks swelled and demand for marked Nippon pieces vastly exceeded the supply. 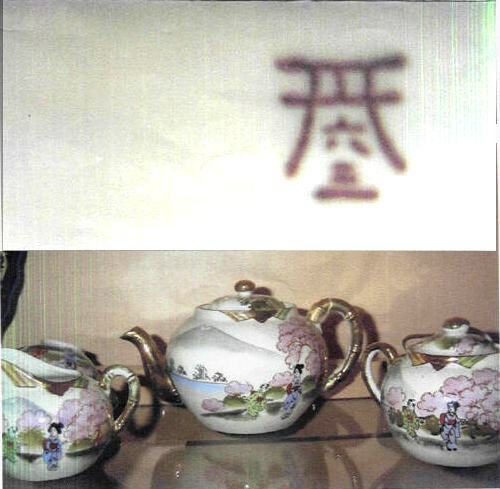 Thus arose the transfer (stencil) based fake Nippon mark applied by unscrupulous dealers to thousands of imported Japanese porcelain. This kind of marks can be identified by the mark being applied inside a glaze area looking a bit like a piece of scotch tape. The resulting flood of fakes became well known to dealers and the more knowledgeable collectors. The motive was money as it usually is and the confusion eventually dampened collector enthusiasm. 1399. Oriental China Nippon. Mark datable to the "Nippon" period 1890-1921, probably 1910-20. 283. "Rising sun" Nippon. This mark is probably related to Noritake. 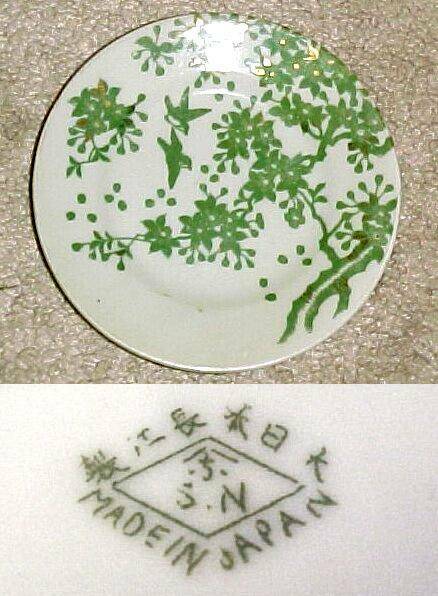 This mark however datable to the "Nippon" period 1890-1921, probably slightly later, maybe at least into the 1930s. 677. "Rising sun" Nippon. 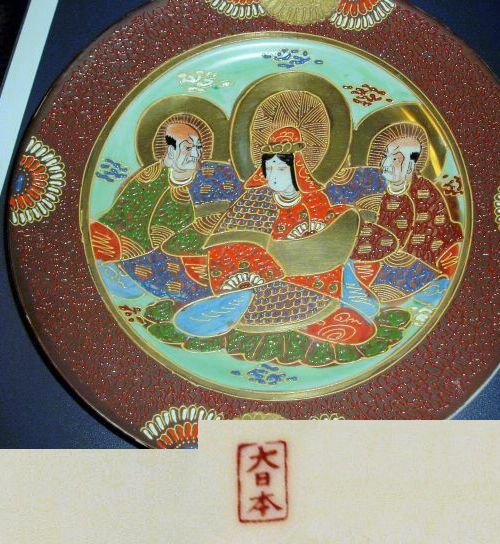 This mark is probably related to Noritake. This mark however datable to the "Nippon" period 1890-1921, probably slightly later, maybe at least into the 1930s. 6. "Rising sun" Nippon. This mark could be related to Noritake. Mark probably in use during 'Early Showa' where Showa was 1926-1988 and 'Early Showa' is often used to cover the Showa reign before 1945. 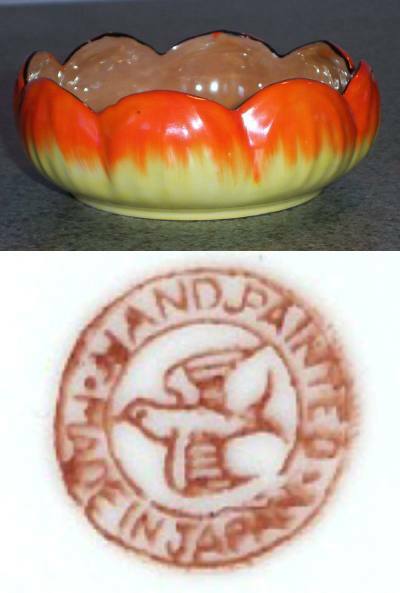 Similar printed marks occur on dated screen printed porcelains as late as 1958. The 2 characters below the "rising sun" are read together as "Nippon"=Japan. 14. "Rising sun" mark. Maybe a "war effort period" mark around 1935-40 due to its simplicity. 534. Mark: GR within Rising sun with the addition of "Made in Japan", suggesting a date to the latter part of the 1940s. 1190. Mark: Japanese characters within Rising sun with the addition of "Made in Japan", suggesting a date to the latter part of the 1940s. 1444. The 2 characters read from top to bottom NICHI HON, which read together as Nippon (= Japan). Bought new around 1960 according to the owner. 13. Mark: "Nippon", meaning: Japan. 7. Mark: "Nippon", meaning: Japan. 12. Mark: "Nippon", meaning: Japan. 42. Mark: "Nippon", meaning: Japan. 24. The 2 characters above the Gothic "A" read from left to right, are NICHI and HON, which read together as Nippon (= Japan). A rough guess on a date would be late 19th century/early 20th century before 1920s. 905. The 2 characters above the "A(L)" read from left to right, are NICHI and HON, which read together as Nippon (= Japan). A rough guess on a date would be early 20th century, before 1920s. 740. Nippon "Japan". Mid 20th century, 1930s (before WWII). 876. Nippon "Japan". Mid 20th century, 1930s (before WWII). 9. Unconfirmed identity but looks like Mount Fuji and a stream. The 2 characters below the picture are read together as Nippon (= Japan). Mark similar to those of Fukagawa. It is possible that this and similar clear red stamped or printed marks actually belongs to the occupied Japan period (1945-52). The red dot following the Japanese character is unexplained. 19. Unconfirmed identity but looks like Mount Fuji and a stream. The 2 characters below the picture are read together as Nippon (= Japan), similar to Fukagawa. 680. Japanese export ware. Unconfirmed identity but looks like Mount Fuji and a stream, similar to Fukagawa. Thought to date to the 1920s or slightly thereafter. 246. Unconfirmed identity but looks like Mount Fuji and a stream, similar to Fukagawa. 723. Mark: Mt. Fuji, a stream, and "Made in Japan", c 1930. Unconfirmed identity but could be Yokoi Sei-Ichi Shoten which closed in 1942. Mark similar to Fukagawa. 1091. 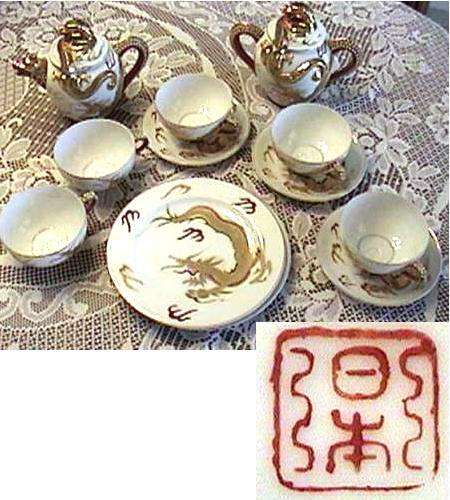 Dragon ware tea set. Mark: Nichi Hon (Nippon). Tentative date, c. 1950. 1514. Dragon ware tea pot. Mark: Nichi Hon (Nippon). Tentative date, c. 1950. These marks appears to belong to the 'Early Showa' period, where Showa was 1926-1988 and 'Early Showa' is often used to cover the Showa reign before 1945. 10, 15, 16, 18. The two characters immediately below the "rising sun" reads, from left to right, Nippon, meaning Japan. The two vertically written characters read Toku sei i.e. "Japan Special Make" or "Specially made in Japan". 1548. The two characters immediately below the "rising sun" reads, from left to right, Nippon, meaning Japan. The two vertically written characters read Toku sei i.e. "Japan Special Make" or "Specially made in Japan". Tentative date from the 1930s. This Nippon Tokusei mark might be from a revival period, at the end of the 1950s. 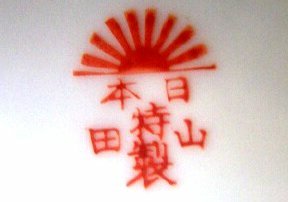 The characters immediately below the "rising sun" reads on this mark form left to right (which is quite modern) as Nippon (=Japan). 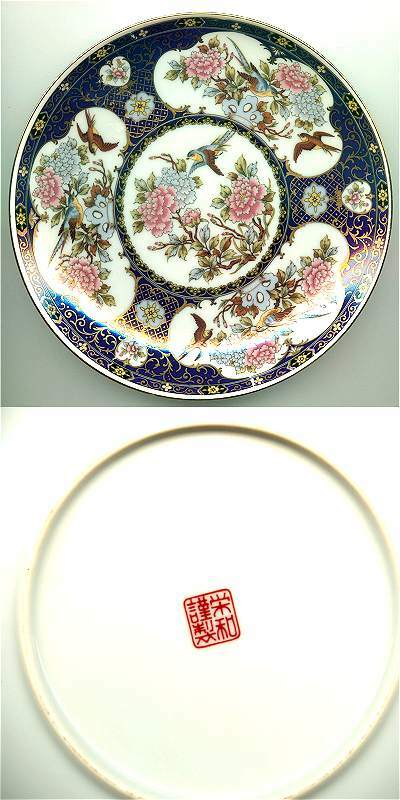 The porcelain is of a very white and glassy type and the decoration as well as the mark seems to be transfer printed with some not too advanced technique, leaving a textile pattern to the printed decoration. You can also see that the beams in the sun are more even than the 'older' ones, and that the characters below the sun are so even also they appears to be printed. 1132. The two characters immediately below the "rising sun" reads, from left to right, Nippon, meaning Japan. The two vertically written characters read Toku sei i.e. "Japan special make" or "Specially made in Japan". Tentative date second half of the 1950s. This mark is Nippon Tokusei mark but with two unidentified characters ("mountain" = san something, usually a decoration workshop) tentative date 1930s. 778. The two characters immediately below the "rising sun" reads, from left to right, Nippon, meaning Japan. The two vertically written characters read Toku sei i.e. "Japan special make" or "Specially made in Japan". The two characters below is probably the name of the decorating workshop. 404. Mark of "Nippon Yoko Boeki Co." "wreath with a bow at the bottom and a clover" The word "JAPAN" is printed in dark green or black with also a faint blue or purple letter that looks like an "S". The factory is still in operation. 683. Mark of "Nippon Yoko Boeki Co." "wreath with a bow at the bottom and a clover"
1040. Mark of "Nippon Yoko Boeki Co." "wreath with a bow at the bottom and a clover". 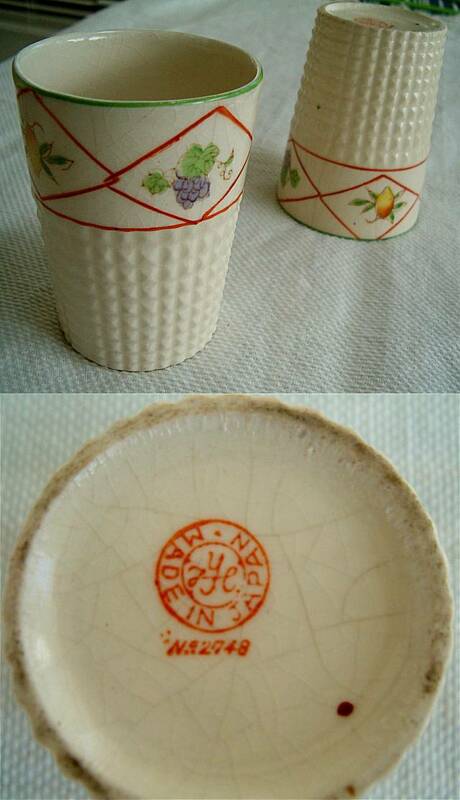 NISHIURA ENJI Porcelain Mfg. Co. 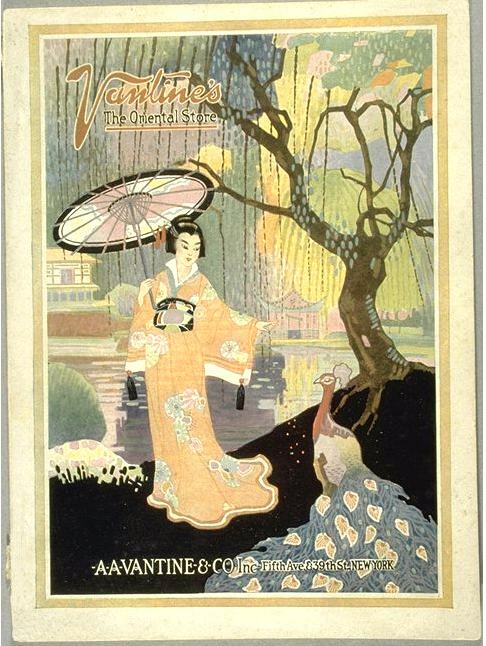 The Handbook of Japan and Japanese exhibits at World's fair, St. Louis, 1904, has the following information: "The porcelains manufactured by us are sold by the Tajima & Co., Boston, Chicago, Yokohama, Kobe, Nagoya, Japan, etc., being well known under the name of Nishiura Yaki. and "Porcelain. 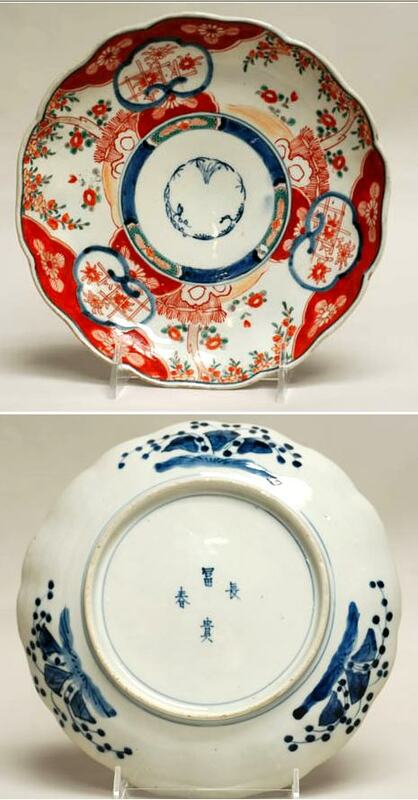 Ã¢â‚¬â€ The output of porcelain in 1901 was valued at 6,935,176 yen, of which 2,491,668 yen constituted the export. Nagoya produced one-third of the total. Gifu, Kyoto, Kanazawa and Kagoshima are the principal localities where the goods are manufactured". (No marks known yet). 589. "OK" company mark, dragon ware. 1930-50 Tajimi City or Seto? 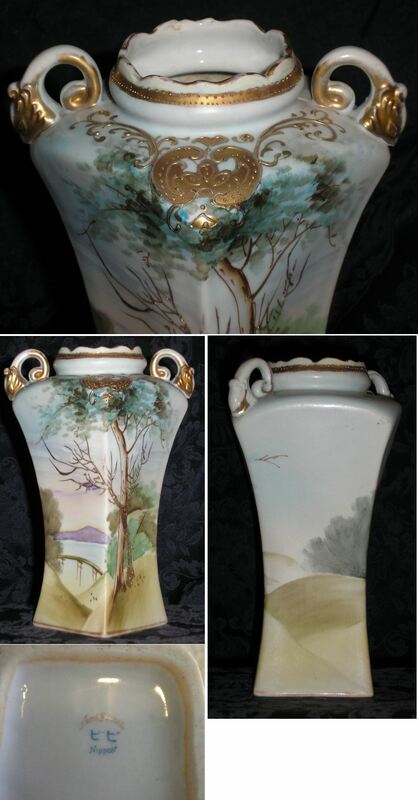 Okura Art China was the forebear of the famed Morimura group of companies such as Noritake (Founded in 1904 as Nippon Toki Kaisha, Ltd. Now, Noritake Co.), TOTO (Toyo Toki Kaisha, Ltd. established in 1917 at Kokura to produce Earthen­ware, Chinaware and Sanitary ware. Now, Toto Ltd.), N.G.K. (Nippon Gaishi Kaisha established in Nagoya, 1919), and INAX. Okura Art China was established in 1919 in the suburb of Kamata in Tokyo by Magobei Okura and his son Kazuchika who were both amongst the 6 founders of the Noritake company in 1904. Okura pieces were made by hand and were of choice material, targeting the top segment of the market. 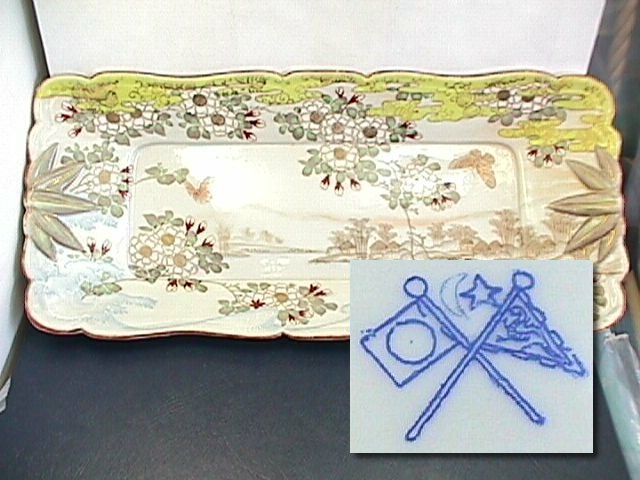 Marks include "OAC Noritake" and a 5 lobed trademark. Okura porcelain is still made today under the name of Okura China Ltd, with its headquarter in Totsuka, Yokohama. 891. Mark: The numbers 6 3 (Rokuzan) under a Japanese gate of honor. A formal gateway or arch such as the one pictured is called a "torii" in Japanese. 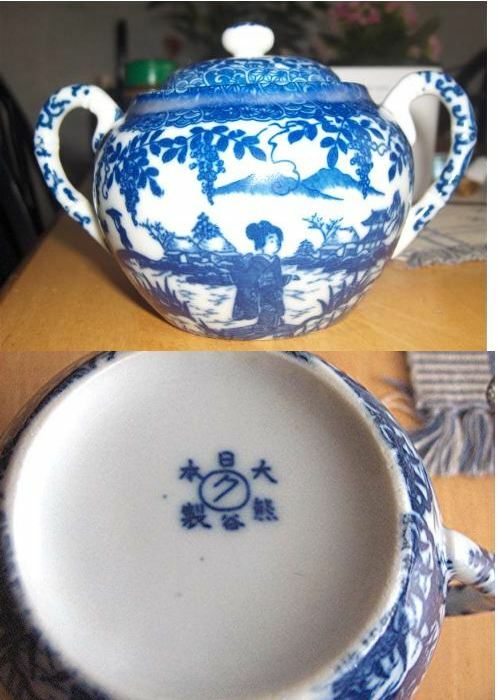 Japanese porcelain, maybe 'Seto' area. Tentative date: 1920-40s. 35. Mark: Above "Made in Japan" a capital "S" superimposed upon a system of four triangles within a fifth triangle. Stamped. 606. Mark "SPP". Marks featuring a crown like this, on the whole seems to date to the period immediately after the second WW, i.e. late 1940s-early 1950s. 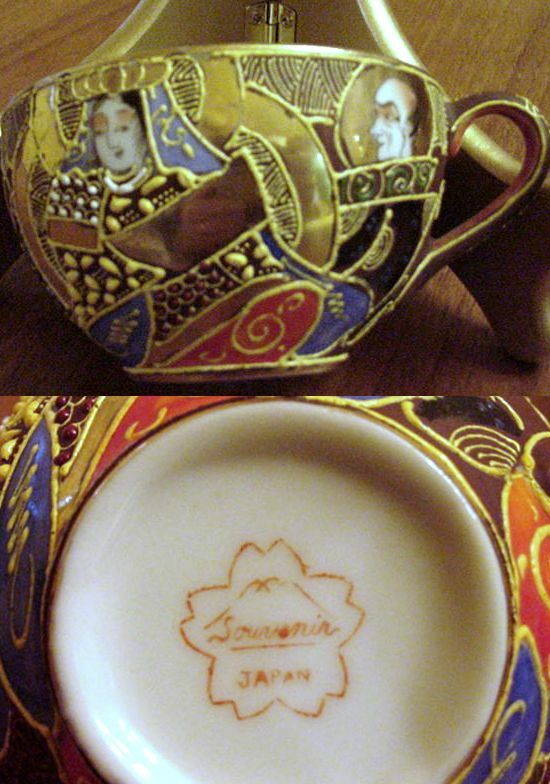 Any information on "Genuine Samurai China" would be appreciated. 607. "Samurai". 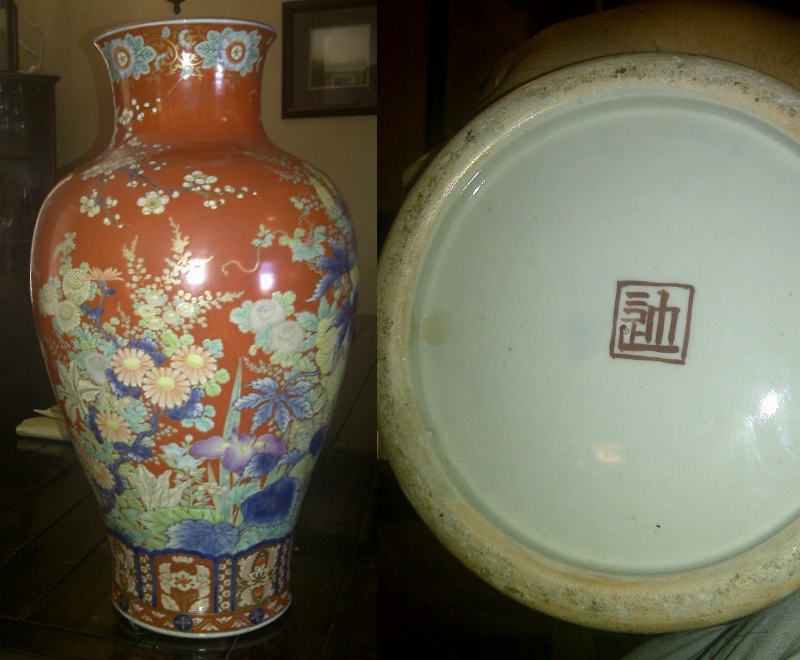 Info on this mark: This Samurai china was bequeathed to me by my late Mother. I understand that it was given to her by her Mother. They lived in Limehouse, London at the turn of the last century, which was London's original Chinatown and central to all the docks, the East India docks, Victoria docks etc. They had no other connection with the far East. The pieces are clearly marked in a semi circle of orange letters on the bottom. All the marks are off center, slightly to the right. 752. 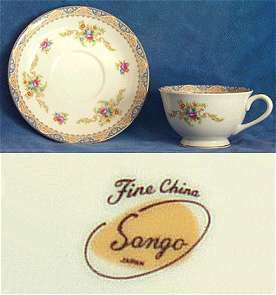 Mark: Sango, Fine China, Mid 20th century, tentatively 1960s. The SEIEI & CO were in business before WWII and seems to have shut down in 1962. 738. Mark: Bird in Circle, "Hand painted, Made in Japan". "Lusterware". Around 1930. 939. Mark: Bird in Circle, "Hand painted, Made in Japan". "Lustre ware". Around 1930. 1370. Mark: Bird in Circle, "Hand painted, Made in Japan". "Lustre ware". Around 1930. Japanese distribution company. Mark can occur on any wares they were reselling and trading in. 17. In the top line, the top right and top left characters are read together as "Nippon" (as in No.6 above). The centre top and centre bottom characters are the vertical characters in No.10, whilst the lower right and lower left characters may read from right to left as "SUZUKI". The two characters written vertically read Nippon Tokusei i.e. "Japan special make" or "Specially made in Japan". 423. Mark: Suzuki [two characters] below a cipher/mark of a company/establishment. 984. Mark is for Suzuki Company, a distributor which had pieces made with its mark for sale and distribution. Presumably mid-20th century. 1133. Mark is for Suzuki Company, a distributor which had pieces made with its mark for sale and distribution. Presumably mid-20th century. This piece dates to around 1958. 1354. Mark is for Suzuki Company, a distributor which had pieces made with its mark for sale and distribution. Presumably mid-20th century. Date likely to be around the 1950. 1355. Mark is for Suzuki Company, a distributor which had pieces made with its mark for sale and distribution. Presumably mid-20th century. Date likely to be around the 1950. 30. Mark: Dai Nippon Suzuki. The 3 rather shadowy characters within the square appear to be "Dai" + "Nichi" + "Hon" which would be read as "Dai Nippon" (= Great Japan). Under the square Suzuki Unconfirmed identity but looks like it could be Mount Fuji and a stream. Mark similar to Fukagawa. 949. Mark: Suzuki, imported to France. 845. Mark: The letter "T" in a wreath, below it says Japan. 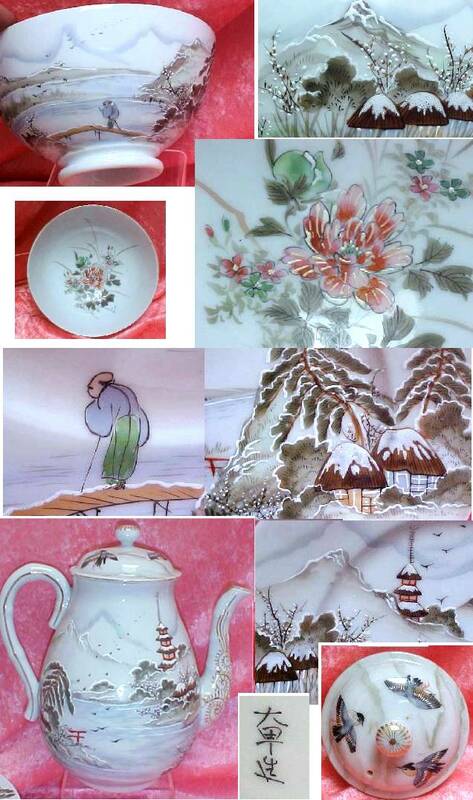 Lusterware (or lusterware) developed by Noritake but the majority of lusterware pieces are made by other companies. One of them were the Takita company, whose mark was T&T in two rectangles. This could be a version of a Takita mark, or just a similar mark. Date: probably late 1920s to early 1930s. 1356. Mark: The letter "T" in a wreath, below it says Japan. 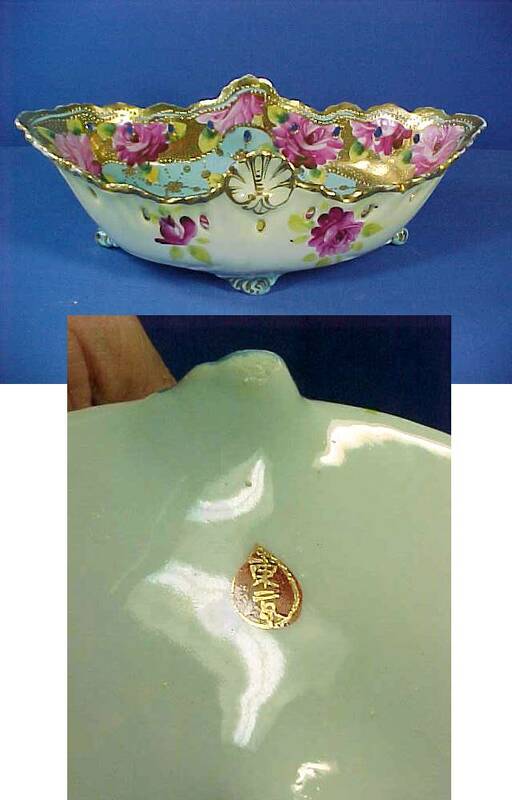 Lusterware (or lustreware) developed by Noritake but the majority of lustreware pieces are made by other companies. One of them were the Takita company, whose mark was T&T in two rectangles. This could be a version of a Takita mark, or just a similar mark. Date: probably late 1920s to early 1930s. 588. Mark: "TMK CHINA". 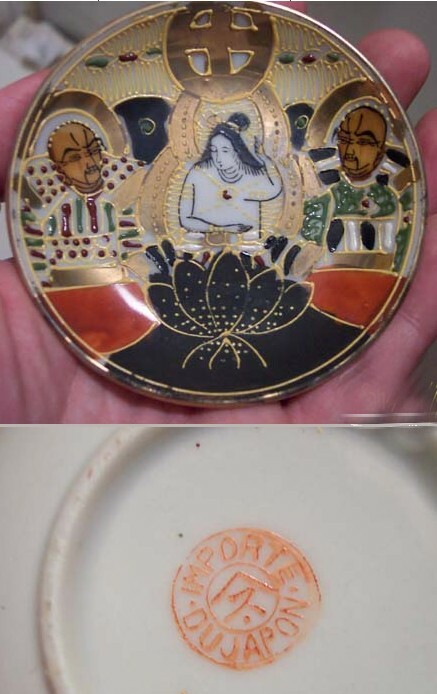 Marked with "geisha girl" lithophane which seems to date this dish to the late 1940s/early 1950s. San Francisco based import company selling wares from various factories. Some pieces are correctly marked as to their producer and beside that, carry a label saying 'Takahashi' (Import Co). 67. Seal reading Takahashi Shokai (shokai also means company). Late 20th century. 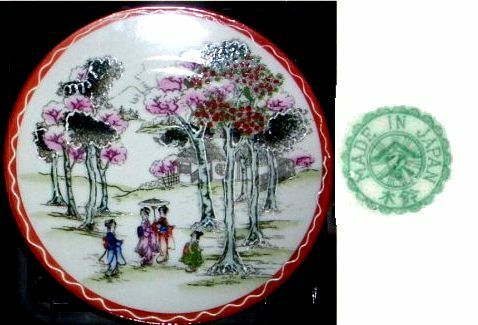 The Takito company 1880-1948, is mostly known as one of those specializing on the Lustre ware type of decoration originally developed by the Noritake company but pieces with moriage decoration in Moriage a'la Kyoto Satsuma on porcelain, are also common. Between 1891 to 1921 the products should be marked 'Nippon'. Marks later than 1945 usually comes with the addition of "Made in Occupied Japan ". 849. Mark: "T T" in two rectangles. Date: probably late 20s to early 1930s when this type of ware was mostly in vougue. 904. Mark: "T T" in two rectangles. Date: probably 1922-44. Tashiro Shoten Ltd porcelain shop in Yokohama which were active before WWII up until 1954. The use of the word "Shoten" indicates the name for a shop which is selling products from its own kiln. The years below are all tentative and we have no firm data on specific years. Carol Bess White, Made in Japan books has it that Goldcastle, CHIKUSA belongs to Tashiro Shoten Ltd in Nagoya, Japan. Other names used by Tashiro Shoten are "Trico", "Trico China", "Royal Trico", and two logo marks: Elephant above MADE IN JAPAN and TA within a cherry blossom flower. For the Japanese market it appears as if a Japanese mark was used since pieces with the elephant mark is hardly or not at all found in Japan today. 1309. Tea or coffee set. Mark: Tashiro. Operated a shop in Yokohama and had distinctively decorated pieces, sometimes by Kutani trained artists. Typical eggshell sold by this shop which ceased business circa 1937. As for a date on the set I think 1930s given the coloration. This set according to family history bought in the 1920-30s in London. 154. Elephant mark. Tashiro Shoten Ltd. The company seems to have shut down in 1954. 138. Elephant mark. Found on a tea set with raised dragon motif on each piece and a "copper-ish" glaze on the inside. Tashiro Shoten Ltd? 681. Elephant mark. Tashiro Shoten Ltd ? 682. Elephant mark. Tashiro Shoten Ltd ? 432. Mark: Tokyo. Early to mid 20th cent. UCAGCO actually means United China and Glass Company. Its offices were based in New Orleans and New York. Ucagco was primarily a distributor of dinnerware and glassware. They were the distributor of many Japanese china patterns during the early 1950s. United China & Glass Co. Inc., better known as UCAGCO, dating back to 1850. Founded by Abe Mayer and originally called Abe Mayer & Co., the importer did business throughout the Southeast U.S. as well as Central and South America. It wasn't until the 30s that the company took on the official trademark of UCAGCO and began expanding overseas. In fact, after the war, the company's agent in Japan, S.A. Stolaroff signed the very first contract allowing imports from Japan. 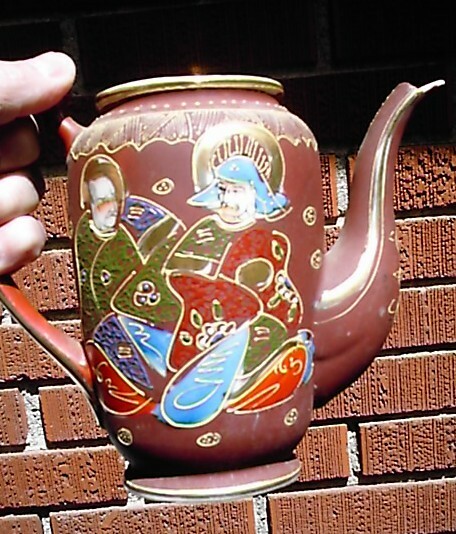 A talented ceramic designer himself, Stolaroff worked alongside many Japanese potteries to lead the company's line of ceramics. In 1956, UCAGCO was sold to Sammons Enterprises and in 1962, Stolaroff, who had become the company's president, retired. 445. Ucagco company. They were very prolific during the Occupied Japan era, this mark is found on some of the better pieces. Most pieces marked this way dates from c. 1947 to 1961. Mid 20th cent. 1072. Ucagco company "Occupied Japan". Date 1945-52. 349. Appears to be Uchida. 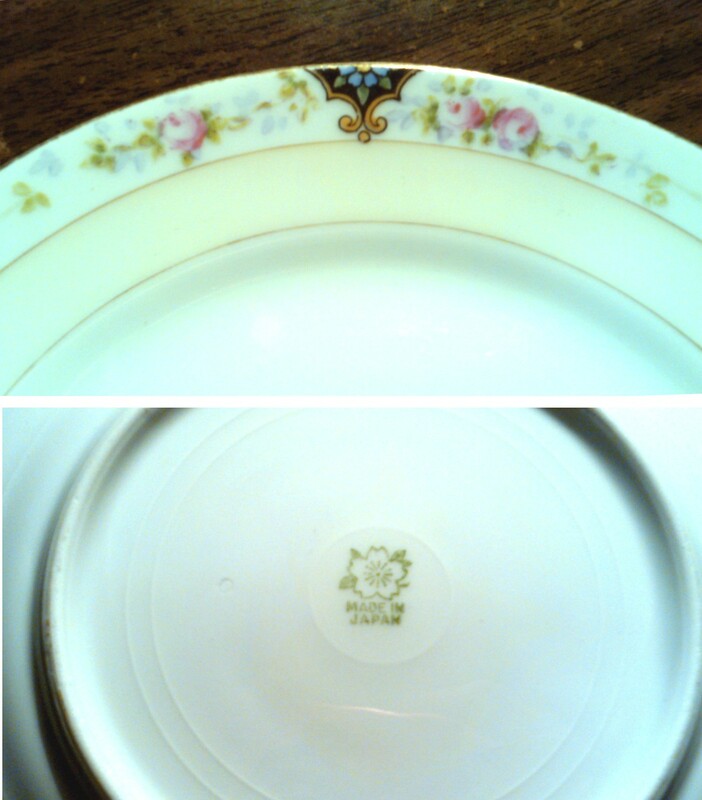 I have started to wonder if maybe all these "wreath"-marks maybe are Noritake porcelain in disguise. The W could be an up-side down M and so on. In 1941 the offices of the Morimura Brothers Export Co were closed and the "M" as in Morimura inside the wreath was changed to an N as in "Noritake", a name it would not officially have before 1981. Still the trade must have continued even under the OJ period. 576. Mark: W in a wrerath. 819. Mark: WH. Wishbone and Horseshoe mark. Japanese porcelain. Possible date 1950s. After extensive discussions on the Gotheborg discussion board I will tentatively list "yago" marks under a separate heading. It has been put forth that the "^"-character or yago is a shorthand word meaning "house", "house name", "roof" or "under the roof of" indication a family workshop. Other sources sees the Yago as a symbol for Mount Fuji in Japan. The kanji character ya also makes up a part of the kanji character tani meaning valley, possibly referring to Ku-tani, mening Nine Valley. 894. Mark "Kawai", Made in Japan. "Rainbow colored decoration". Tentative date 1940-50s. 1090. Mark: "Dai Nichi Hon" (Great Japan) over a sign meaning "roof/house" and the number "three", early 20th century. It is generally accepted that marks that includes "Dai Nippon" in Japanese characters on the whole date to the Meiji (1868-1912) period, reflecting the greatly increased nationalism of that period. 749. "YAMAKA". Late 20th century, 1950-60s. Kiln in Saga Prefecture that began production at the beginning of Meiji (1868-1912) period and still operates today. 1096. Impressed mark: Yamatoku (Mountain virtue). Mark when impressed is in 'katagana' characters. Arita, Imari porcelain. On Igezara transfer ware plates this mark occurs mostly around 1910-20. 1219. Impressed Mark: Yamatoku. Yamatoku kiln started in the early Meiji (1868-1912) period and is still operative today. According to a Hizen marks book this Yamatoku mark dates to 'late Meiji - Taisho', tentatively 1920s to 30s. 1510. Impressed Mark: Yamatoku. Yamatoku kiln started in the early Meiji (1868-1912) period and is still operative today. According to a Hizen marks book this Yamatoku mark dates to 'late Meiji - Taisho', tentatively 1920s to 30s. 1433. 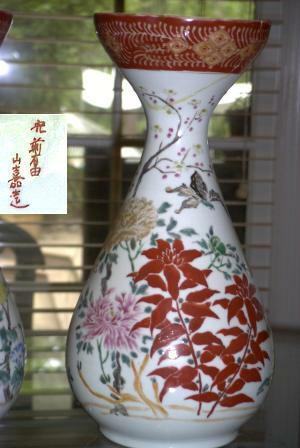 Vase in Japanese Imari style. Unknown mark. Yoshi meaning 'luck' could also be read as kichi. 1523. Stamped mark of a name Yoshiyama, yoshi meaning luck could also be read as kichi. 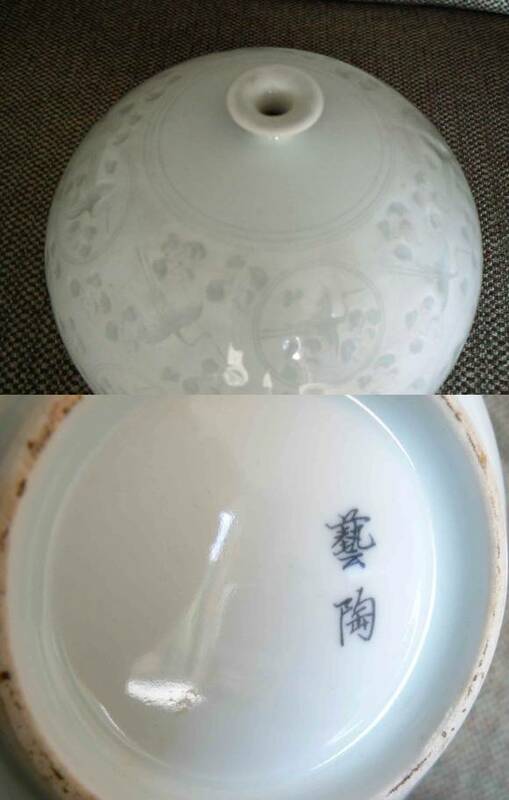 Mark from a Japanese egg shell type porcelain tea set that was sent from Shanghai in 1931 according to family tradition. 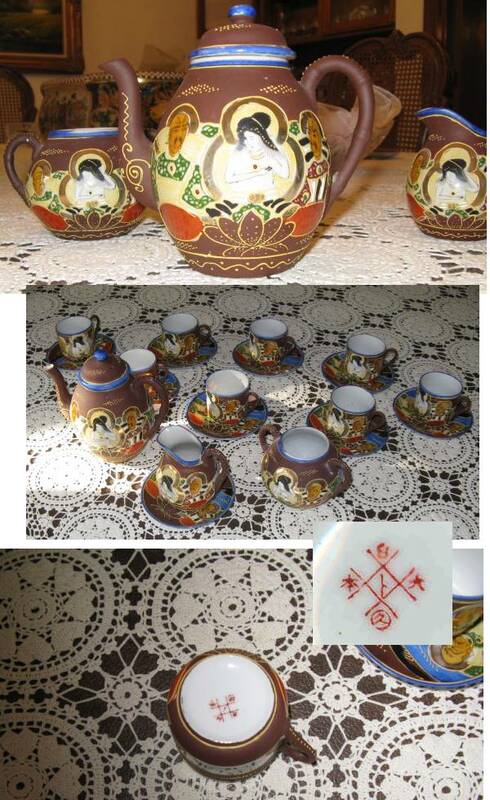 The set is of 41 pieces incl: 12 cups, saucers & plates, 2 serving plates, 1 bowl, covered sugar bowl, creamer and a Teapot. Tentative date ca. 1930. 1317. Plate. Mark: Bi Nou Nishi Ura, meaning "Beautiful Dark Western Seacoast/Bay". Contemporary, probably 1970s-1990s. 921. Mark: Might be saying "Imari" in Chinese. Date: 20th century. 742. Mark: ? zan, Late 20th century. 53. This mark is typical of "seal characters". It is difficult to identify them unless there is an example available to assist identification. The following marks are still to be sorted into groups. Help appreciated. 578. Tea or coffee set. According to family history this should be before 1914 and possibly as early as 1890s. 58. Mark: Dragon Seal. Could possible be Chinese but, unknown. 33. Green enamels on black. Unknown. 900. Japanese export porcelain. Mid to late 1920s. 1298. Plate. Japanese export porcelain. Mid 20th century. 1363. Brush washer with blue and white decoration of a fish. Tentatively a Japanese ware. Mark reads Shin Ken En Sei (New Combined Gardens Made). Seto is a good guess or perhaps Hirado, except that the paste in that case should have been whiter. Decoration of sweetfish (Ayu) in the river which is a Japanese theme but, also occurs in Chinese decorations. Early to mid 20th century. 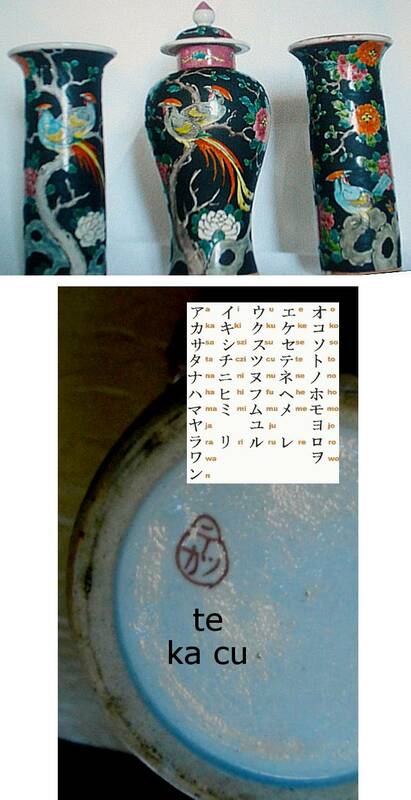 Mark including "Kaga no Kuni" meaning that these ceramics were produced in Kaga Han (today Kanazawa). Kaga Han and Daishoji Han merged in 1871 to make up the Ishikawa prefecture. However at this period the name Kaga was widely used in Japan and also overseas to designate more generally the ceramic produced in the area. For a period Kaga No Kuni appears on some marks togehter with Kutani to later be replaced with only Kutani. Kutani marks are most commonly met with as a two character "generic" Ku (Nine) tani (Wallys) name, meaning that the individual potter or even kiln cannot be identified. However occasionally the inscriptions details both the area, the kiln, the potter and the decorator. 1365. Dish of "egg shell" quality. Japanese Kutani porcelain with enamel decoration. Iron red six character hand painted mark "Kaga no kuni Oda Sei". Mid 19th century to early 20th century. 1456. Globular vase. Mid 20th century.